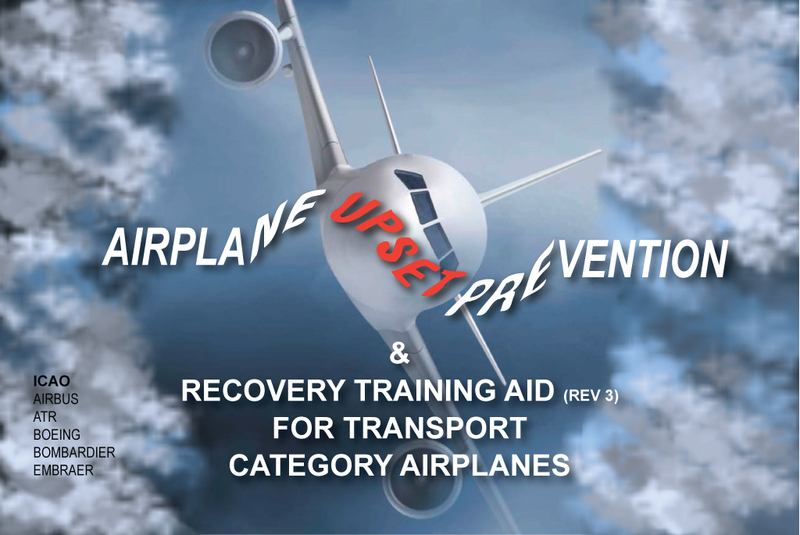 Based upon ICAO document 10011, Airbus, ATR, Boeing, Bombardier, Embraer and ICAO have created Revision 03 of the Airplane Upset Recovery Training Aid to emphasize the importance of prevention. This revision is expanded to include transport category straight wing propeller airplanes and regional jet airplanes. With focus upon recognition and avoidance, it is the Original Equipment Manufacturers (OEMs) motivation to ensure pilots are properly taught to operate their airplanes throughout the entire operational flight envelope. Passing a type rating/skill test check ride is not a complete measure of how well the pilot(s) understand the performance and handling characteristics of their airplane, because this check is completed in a narrow band of the overall envelope. Training programs leading up to type rating checks are usually focused on the environment to be tested, rather than on the entire operational flight envelope the pilots will be exposed to. Moreover, a large portion of the operational flight envelope where the pilots will usually operate is systematically managed through use of autopilots and auto thrust/throttle systems. Therefore, it is realistically impossible for pilots to recognize and respond correctly to an undesired airplane state without having practical knowledge of the airplane performance and handling characteristics available (or not available) to them throughout the entire operational flight envelope. With this document, it is the OEM's intent to emphasize that training within the entire operational flight envelope (as per AFM) is needed to develop pilots' awareness and handling skills, both in manual and automated flight. Training outside the operational flight envelope should not be necessary for awareness and skill development. Without first exposing pilots to the entire operational flight envelope, developing training sequences beyond this envelope could lead to significant negative transfer of training. Academic training and OEM recommended FSTD exercises (within the capabilities of existing simulation devices) to expose the pilots to the airplane's handling characteristics and performance envelope will add significant benefits to managing undesired airplane states and preventing upsets. The OEM recommended training sequences within this document are grouped by upset-inducing topics, with each topic consisting of the exercise conditions, training objectives, description and rationale. Recommended crew actions for both "Stall Recovery Procedure" and "Upset Recovery Techniques" as well as training scenarios have unanimous agreement among these OEMs and are reflected in this Training Aid. The goal of this "Airplane Upset Prevention and Recovery Training Aid" (AUPRTA) is to increase the ability of pilots to recognize and avoid situations that can lead to airplane upsets and to improve their ability to recover control of an airplane that diverges from a crew's desired airplane state. 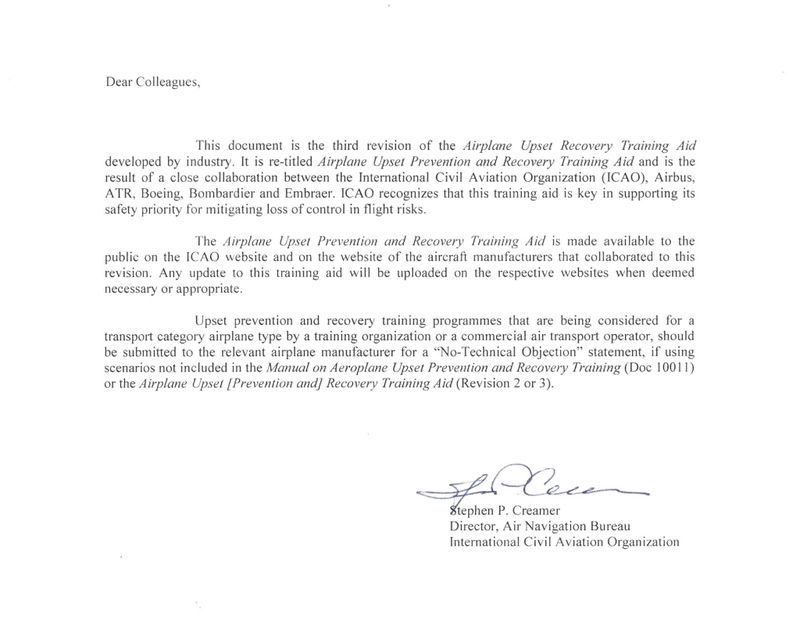 The education material and the recommendations provided in the Airplane Upset Prevention and Recovery Training Aid Rev3 has been reviewed, updated (where necessary) and agreed upon by many OEMs who were involved in various working groups in recent years. Additionally, the training and recovery recommendations contained within are unanimously agreed upon by these OEMs. These recommendations are the result of experience derived in pertinent transport category airplanes and not concluded from simulator assumptions, or non-transport airplanes. The foundation of this document remains that which was originally developed through an extensive review process by a large industry group in order to achieve a consensus of the air transport industry. This video remains as relevant today as when it was created during 1997. Original extract from AURTA video. Because there are an infinite number of variables that comprise upset situations, it is not appropriate to attempt to define testing or checking criteria. The goal is to avoid an upset, intervene if one is developing, or to regain control. Training to proficiency has shown to be the best and only way to achieve this goal. Airplane upset recovery education must not include simulator testing criteria. By definition, testing implies procedure demonstration and objective assessment of performance. OEMs have generally defined recommendations instead of procedures. This is because no two upsets are the same. Learn airplane maneuvering techniques throughout the airplane operational flight envelope to perform recoveries from upsets. An airplane upset is an undesired airplane state characterized by unintentional divergences from parameters normally experienced during operations. An airplane upset may involve pitch and/or bank angle divergences as well as inappropriate airspeeds for the conditions. Note: undesired airplane state is defined in the Line Operations Safety Audit (LOSA) manual, ICAO Doc 9803, 1st edition. Deviations from the desired airplane state will become larger until action is taken to stop the divergence. Return to the desired airplane state can be achieved through natural airplane reaction to accelerations, auto-flight system response or pilot intervention. The OEMs believe that flight crew engagement combats complacency through active monitoring. Therefore, active monitoring is the critical element to ensure awareness and avoidance of undesired airplane states and provides the strongest countermeasure against startle. An engaged crew is in the best position to cope with undesired airplane states. From the early stages of training, pilots acquire Knowledge, Skills and Attitudes to perform active monitoring throughout all operations and phases of flight. This should become part of the "competent pilot DNA". "Active monitoring is a proactive knowledge-driven process of encountering and keeping track of how things are in relation to the perceiver and his expectations to enable the perceiver to take meaningful action. Active monitoring involves proactively seeking relevant information, making important information available, filtering information that is meaningless, creating new information, and off-loading cognitive processing onto the interface or adapting the interface to support monitoring". In the context of undesired airplane states, active monitoring means keeping track of the environment, the airplane's energy state and flight path trajectory. This creates expectations about future airplane state to detect deviations in order to take timely corrective actions. Effective monitoring of the environment, the airplane energy state and flight path depends very heavily on an accurate and comprehensive understanding of the current airplane's energy state and flight path trajectory based on the relevant indications of its status. This understanding, or mental model, can then be used to create expectations about future state and deviations from the expected state. These expectations then serve as a baseline for monitoring. Pilots using their knowledge to formulate an understanding (mental model). Their understanding (mental model) is used to create a set of expectations that directs their attention and their perception of events, e.g. if you are expecting to level off you are likely to monitor parameters associated with level off. When their expectations are not met, pilots use their knowledge to direct their attention to seek and perceive additional information to fill any gaps in their understanding that were identified by the deviations. Actively seeking more information is part of the monitoring process leading to corrective actions if necessary. Monitoring other parameters, changing the display information, and communicating with the other crew members are ways to get more information. Active monitoring is the responsibility of all crew members to ensure the airplane state is understood and correct for the situation. NASA Aviation Safety Reporting System (ASRS) and NTSB analysis of several loss of control accidents highlight the most prevalent causes. A predominant number of upsets has an environment element involved. Because the crew cannot modify the environment, it is essential they are aware of the risks so they can be minimized or avoided all together. Turbulence, when extreme, can lead to airplane upsets, and/or structural damage. 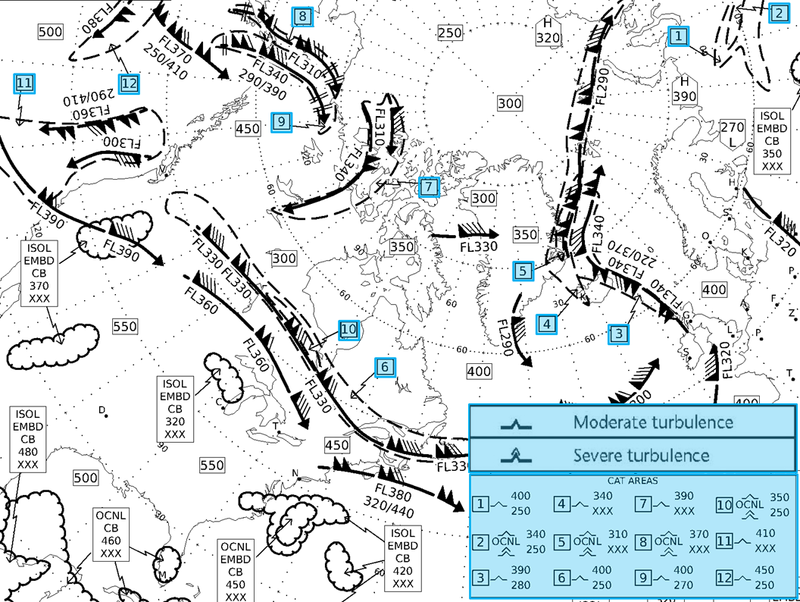 These incidents of turbulence can cause large airspeed, altitude, or attitude deviations. Severe or extreme turbulence can be associated with CAT (Clear Air Turbulence), mountain waves, windshear, and thunderstorms. Turbulent atmosphere is characterized by a large variation in an air current over a short distance. The main causes of turbulence are jet streams, convective activity, obstructions to wind flow and windshear. Turbulence is categorized as "light", "moderate", "severe" and "extreme". Clear air turbulence (CAT) is defined by the FAA Aeronautical Information Manual as "high-level turbulence (normally above 15,000 ft above sea level) not associated with cumuliform clouds, including thunderstorms." Although CAT can be encountered in any layer of the atmosphere, it is almost always present in the vicinity of jet streams. CAT is particularly difficult to predict as it is extremely dynamic and does not have common dimensions or area or time. 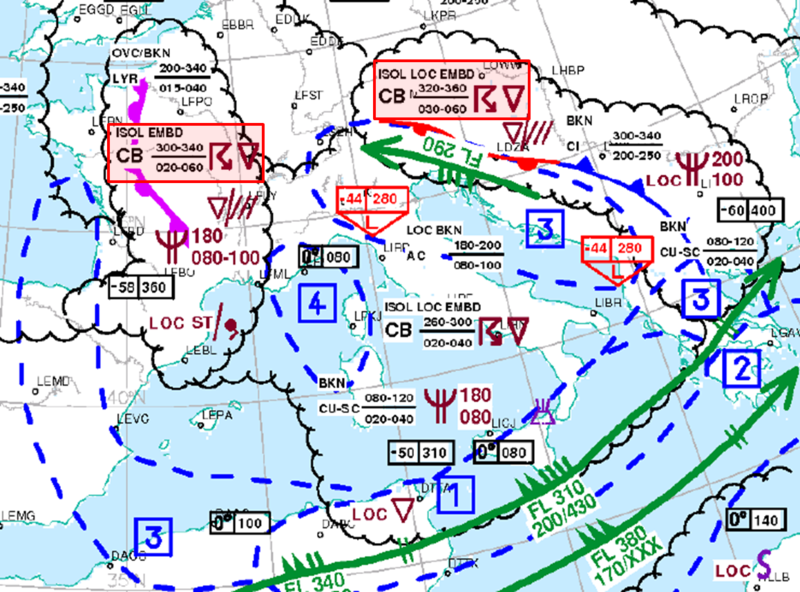 In general, areas of turbulence associated with a jet stream are from 100 NM to 300 NM long, elongated in direction of the wind: 50 NM to 100 NM wide and 2 000 ft to 5 000 ft deep. Mountains are the greatest obstructions to wind flow. 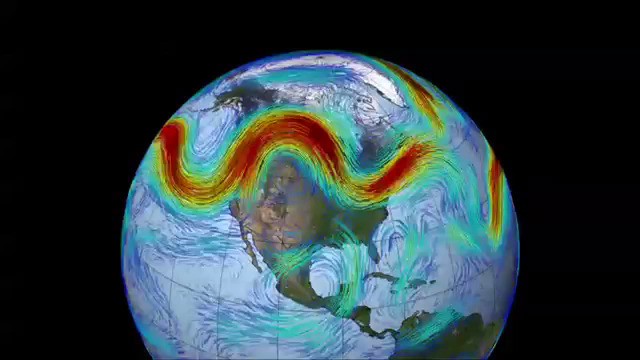 This type of turbulence is classified as "mechanical" because it is caused by a mechanical disruption of wind. Over mountains, rotor or lenticular clouds are sure signs of turbulence. However, mechanical turbulence may also be present in air too dry to produce clouds. A rapid change in wind speed and/or direction over a relatively short distance in the atmosphere is the primary characteristic of windshear. Thunderstorms and rain showers can produce violent windshears that are a hazard to safe flight (See Thunderstorms). 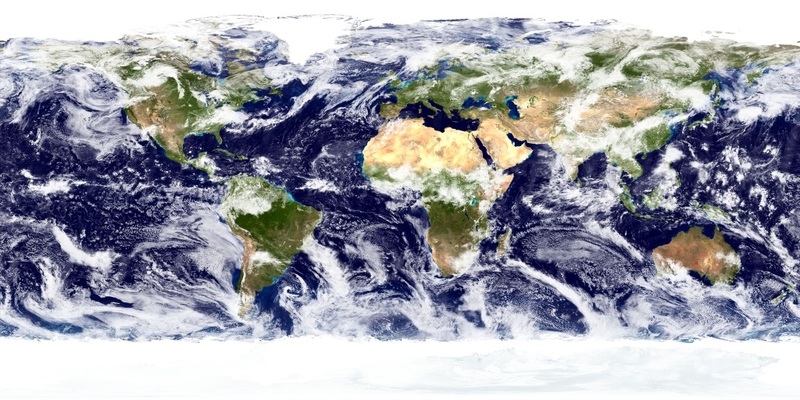 Windshear can also result from a large variety of meteorological conditions such as terrain, temperature inversions, sea breezes, frontal systems, strong surface winds. There are two types of thunderstorms: air mass and frontal. Air mass thunderstorms are randomly distributed in unstable air, and they develop from localized heating of the Earth's surface. As the heated air rises, it cools to form cumulus clouds, which can continue to develop vertically and produce precipitation in the higher levels. Precipitation signals the beginning of the mature stage and the presence of a downdraft. The growth from cumulus to mature thunderstorm can last approximately one hour. Over this time span, the heated updraft growing the thunderstorm is cooled by the rainfall and the thunderstorm will dissipate. Many thunderstorms produce an associated cold air gust front as a result of the downflow and outrush of rain cooled air. These gust fronts are usually very turbulent and can cause rapid divergences from stabilized flight. Frontal thunderstorms are usually associated with weather systems line fronts, converging wind, and troughs aloft. Frontal thunderstorms form in squall lines; last several hours; generate heavy rain, and possibly hail; and produce strong gusty winds, and possibly tornadoes. The principal distinction in formation of these more severe thunderstorms is the presence of large, horizontal wind changes in both speed and direction at different altitudes in the actual thunderstorm. This can cause the thunderstorm to be vertically tilted, which means the precipitation falls away from the heated updrafts resulting in a much longer maturity timeframe. The heated updrafts will rise to much higher vertical velocities which ultimately result in higher horizontal wind velocities at the surface. The downward column of air, or downdraft, of a typical thunderstorm is quite large at about 1 NM to 5 NM in diameter. Resultant outflows may produce large changes in windspeed and/or direction (windshear). 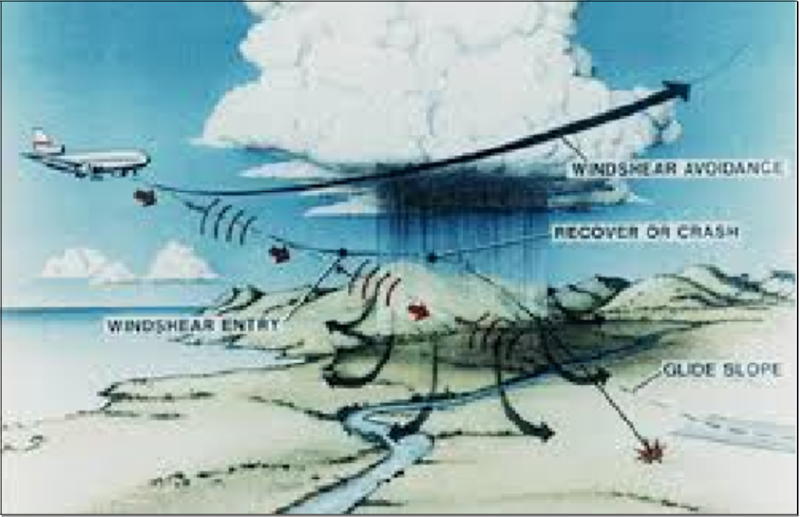 A more concentrated and powerful downdraft is known as a microburst. These severe thunderstorm phenomena can occur anywhere convective weather conditions exist. 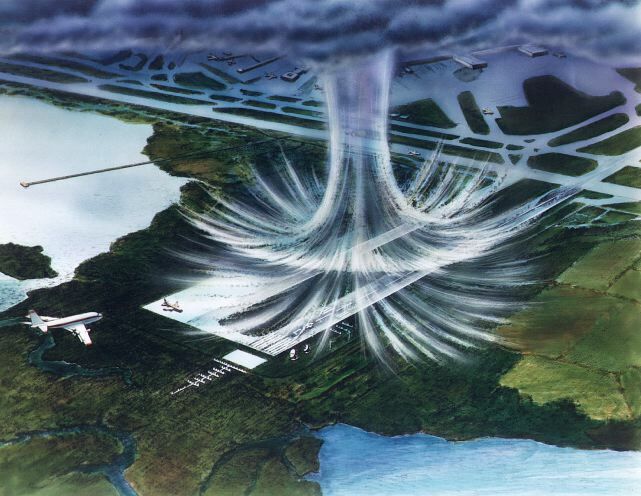 When a microburst downdraft reaches the ground, it spreads out horizontally and may form one or more horizontal vortex rings around the downdraft. The outflows are not always symmetrical, therefore no assumed performance changes can be determined. It is vital to know that if encountered, some microbursts cannot be successfully recovered from using any known techniques. Approximately 5% of all thunderstorms produce a microburst. Downdrafts associated with microbursts are typically only a few hundred to 3000 ft across. Icing will lead to a large degradation in airplane performance if ice accumulation is allowed to build-up on airplane surfaces. Although icing can accrete quickly, it usually accumulates over time. The location and type of ice is critical to flight performance, hence the axiom "keep it clean". Unexpected airplane handling characteristics can be expected with ice build-up. Further information in Chapter 6.6. Icing. Wake turbulence is involved in the largest number of documented upset events. However, a wake turbulence encounter does not mean that a developed upset will occur. A rotational vortex is created behind an airplane's wings as a result of lift created. The area of greatest vortex energy is within the small core at the center of the rotating air. The energy, and hence rotational force, dissipates rapidly from the core outward, even though a rotation still exists. 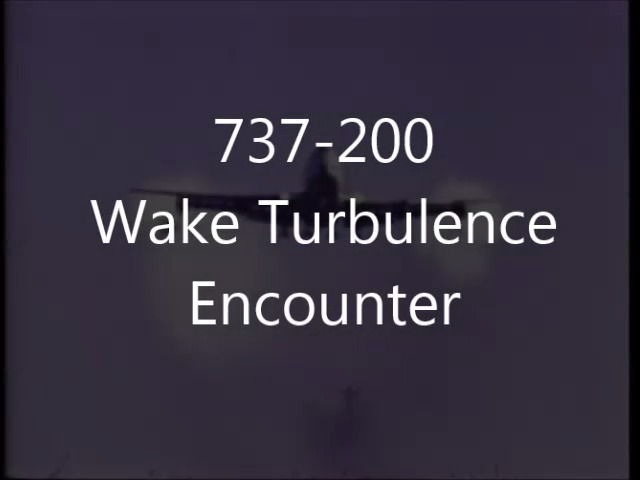 An encounter with wake turbulence usually results in a rapid but short rolling or pitch moment and, in rare instances, could cause structural damage to an airplane. Opposing a roll moment using normal roll control (aileron and roll spoilers) is usually effective and induced roll is minimal in cases where the wingspan and ailerons of the encountering airplane extend beyond the rotational flowfield of the vortex core. With either little or no input, an airplane encountering wake turbulence, will be expelled from the vortex. The strength of the turbulence is determined predominately by the weight, wingspan and speed of the airplane. Generally, vortices descend at an initial rate of about 300 ft/min to 500 ft/min for about 30 s. The descent rate decreases and eventually approaches zero between 500 ft and 900 ft below the flight path. Pilot and air traffic control (ATC) procedures and standards are designed to avoid wake turbulence. Wake turbulence is a definite cause factor within upset statistics. However, the resulting upset is often the result of crew over reaction to the wake. This can perhaps be more clearly understood because of the over exaggeration of many diagrams and schematics illustrating the intensity and potential of a vortex encounter. Improvement in airplane designs and equipment components has always been a major focus in the aviation industry. In spite of this continuing effort, there are still failures. Some of these failures can lead to an airplane upset. Most failures are survivable if correct responses are made by the flight crew. Flight crews are trained to overcome or mitigate the impact of single or multiple failures. All airplane operating manuals provide flight instrument information so that when failures do happen, the pilot can analyze the impact and select the correct procedural alternatives. Airplanes are designed to make sure pilots have at least the minimum information needed to safely control the airplane. Past accident reports point out that pilots are not always prepared (actively monitoring) to correctly analyze the situation and an upset can develop. Autoflight systems include the autopilot, auto-throttles, and all related systems that perform flight management and guidance. The systems integrate information from a variety of other airplane systems. They keep track of altitude, heading, airspeed, and flight path self-monitored to a high degree of accuracy. All of these devices are designed to reduce the flight crew workload. As reliable as the autoflight systems have become, they can still malfunction. The pilot community has tended to develop a great deal of confidence in the systems, and that has led to complacency in some cases. Because of the integration of systems, full analysis to determine the cause of the anomaly can be difficult for a pilot. Flight control anomalies, such as flap asymmetry, spoiler problems and others, are addressed in airplane operations manuals. Unlike most system faults, flight control anomalies could require immediate action from the pilot. Pilots must cross-check and interpret the instruments. When a divergent indication exists from what was intended, it must be communicated to the other pilot and corrected with proper pitch, bank and power adjustments. Misinterpretation of the instruments and/or lack of "active monitoring" by the pilots can lead to an airplane upset. An important factor influencing cross-check technique is the ability of the pilot: all pilots do not interpret instrument presentations with the same speed; some are faster than others in understanding and evaluating what they see. One reason for this is that the natural ability of pilots varies. Another reason is that the experience levels are different. Most of the time, the level of crew "active monitoring" is a prime factor. Proper instrument crosscheck must be adequately trained and practiced. Because situations may change rapidly during high work-load periods, it is crucial for both pilots to monitor the flight path and instruments. In a low workload environment, one pilot can usually monitor the airplane as there is normally little change. Since it is difficult to stay focused on monitoring during low workload periods, it may be beneficial for pilots to alternate this responsibility. The important thing to remember is that at least one pilot must monitor the airplane at all times. Effective active monitoring allows the crew to intervene before an upset can occur. A satisfactory instrument cross-check is only part of the task because it is necessary for the pilot to ensure the correct adjustments to pitch, bank and power are made in order to control the airplane. Airplane upsets have occurred when the pilot has made incorrect adjustments. This can happen when the pilot is not familiar with the airplane response to power adjustments or control inputs. Pilots are very well experienced in the low altitude environment, but usually only observe the autoflight systems handle the airplane at high altitude. For this reason, they tend to make larger than necessary control inputs (inputs which would be appropriate at low altitude will most likely be too large at higher altitudes). Control inputs are usually based upon understanding what the outcome should be. If the pilot's control inputs are reactionary, unplanned or excessive, the airplane reaction may be a complete surprise. A continued divergence from what is expected due to excessive control inputs can lead to an upset. The following animation illustrates pilot flight control inputs that make the turbulence divergence larger instead of smaller. There have also been instances when two pilots have applied opposing inputs simultaneously leading to an upset or a failure to recover from an upset. A review of airplane upsets shows that inattention or neglect of "actively monitoring" can result in upsets. Many events can be traced to inadequate instrument cross-check; for example, neglecting to monitor all the instruments or fixating on certain instrument indications and not detecting changes in others. Although flight path control responsibility is shared while under ATC radar vectoring, situational awareness and vigilance cannot be relaxed and/or delegated to ATC. Distractions can be external or self-induced. "Control the airplane first" has always been a guiding principle in flying. Cockpit discipline is the principle that must be respected to ensure that at least one pilot is actively monitoring. It is impossible to intervene to stop a divergence if the crew is not actively monitoring the airplane. A pilot who is aware of the energy and flight path is less likely to be startled and therefore more likely to deal with the situation with controlled inputs versus reactive responses. While this is a very rare occurrence, it does happen and pilots need to be prepared to react properly. Incapacitation occurs in many forms ranging from sudden death to subtle, partial loss of mental or physical performance. Subtle incapacitations are the most dangerous and they occur the most frequently. Incapacitation effects can range from loss of function to unconsciousness or death. Suspicion of some degree of gross or subtle incapacitation should also be considered when a crewmember does not respond to any verbal communication associated with a significant deviation from a standard procedure or standard flight profile. Failure of any crewmember to respond to a second request or a checklist response is cause for intervention. Airlines must establish clear policy to address subtle incapacitation. Spatial disorientation has been a significant factor in many airplane upset accidents when a crew member does not follow what they are seeing on the flight instruments because they believe the instruments are incorrect. Spatial disorientation is the inability to correctly orient oneself with respect to the Earth's surface. All pilots are susceptible to sensory illusions while flying at night or in certain weather conditions. These illusions can lead to a conflict between actual attitude indications and what the pilot "feels" is the correct attitude. Disoriented pilots may not be aware of their orientation error. Many airplane upsets occur while the pilot is engaged in some task that takes attention away from the flight instruments. Spatial disorientation usually impacts only one of the crew members. Therefore, if the other crew member recognizes something unexpected, it is imperative to communicate this observation or take control (including engaging AFS). Spatial disorientation is a form of incapacitation. Airlines must establish clear policy to address spatial disorientation. It must be emphasized that safe flight can only be accomplished when an effective instrument cross-check is being done. This applies to IMC or VMC. Any situation or factor that interferes with the flow of flight information to the pilots increases the potential for disorientation. Technology in modern airplanes includes flight directors, autopilots, auto-throttles and flight management systems. Systems will react to what the pilot commands even if it is not what the flight crew intended. Failure to confirm and monitor intended modes of operation may lead to an airplane upset. Reliability of modern technologies can lead to overconfidence and eventual complacency. All airplane are developed and certified to ensure control is easy and well-behaved throughout the operational flight envelope. Testing to ensure these good handling characteristics assumes that pilots are utilizing typical piloting techniques. In some circumstances, pilot control inputs can cause unwanted secondary airplane motion that could lead or contribute to an upset or loss of control. This condition occurs when a pilot's commands become out of phase with the airplane's motion. There could be a number of technical or human factor causes for this condition, including over-speed, some out-of-trim conditions or some flight control system failures. To the pilot, all of the causes result in the airplane not responding as quickly, or as aggressively, as the pilot desires. This leads to pilot inputs that grow increasingly out of phase with the airplane response. During an upset recovery a PIO/APC can also be initiated when the pilot reacts with large rapid inputs before determining what is happening. The net effect is that pilot inputs may produce unexpected airplane motion with accompanied pitch or roll oscillations. Sometimes, the PF may be so involved in regaining control, s/he may not be aware of this oscillatory motion. In this case, the pilot monitoring may need to verbalize the PIO/APC condition or be prepared to take control. Airplanes are designed, tested and certified based on accepted assumptions of how pilots will operate them, as well as various environmental and technical constraints (e.g. gusts or engine failure dynamics). These assumptions drive the regulatory certification requirements and are validated through in-service experience. The certification flight test process examines the entire flight envelope of the airplane, including that area beyond which the airline pilot normally operates. The process even explores how the airplane could possibly be inappropriately operated; however, the testing assumes fundamental flying skills are known, understood and that pilots are not complacent or situationally unaware. A primary assumption regarding pilot control inputs is that they are the result of training and experience and not arbitrary deflections in various axis. Exaggerated rates and amounts of control deflection (over controlling) may cause an accelerating divergence of flight path control. Pilots are expected to make control inputs based on desired airplane reaction. Control inputs appropriate at one point in the flight envelope might not be appropriate in another part of the flight envelope. Pilots must have a fundamental understanding of flight dynamics in order to correctly determine the control input(s) necessary. There must be a force, or a combination of forces, imposed on an airplane to achieve a desired trajectory. The generation of forces created by control inputs is the subject of aerodynamics (to be discussed later). 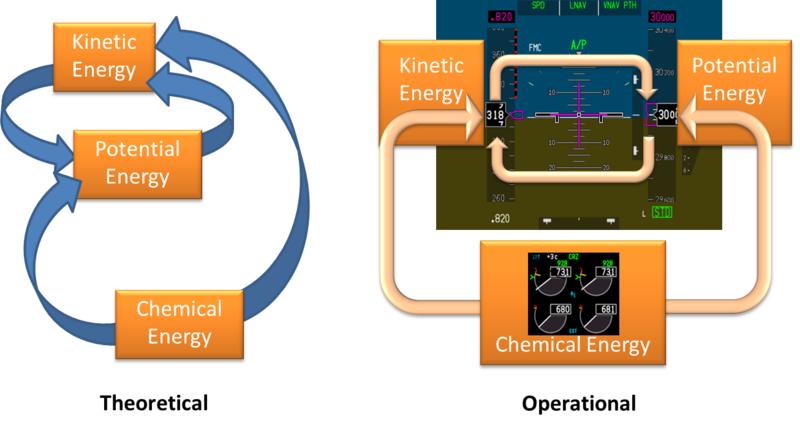 A pilot has three sources of energy available to manage or manipulate the flight path of an airplane. The term "energy state" describes how much of each kind of energy the airplane has available at any given time. Pilots who understand the airplane energy state will be in a position to know instantly what options they may have to maneuver their airplane and therefore manage the trajectory. Kinetic energy, which increases with increasing airspeed. Potential energy, which is proportional to altitude. Chemical energy, from the fuel in the tanks which can be converted to thrust. Kinetic energy needs to be replenished (from potential or chemical energy), as it is continuously expended in the process of generating the aerodynamic forces acting on the airplane which result in controlled flight (lift and drag). This process of consciously controlling the energy state of the airplane is referred to as "energy management". The trading of energy must be accomplished with a view toward the final required energy state. The objective of energy management is to keep the desired kinetic, potential and chemical energy within operating limits. This objective is especially important during an inadvertent upset and the ensuing recovery. The process of controlling forces to produce a new energy state takes time. The amount of time required is a function of the mass of the airplane and the magnitude of the applied forces. Airplanes of larger mass generally take longer to change orientation than airplanes of smaller mass. The longer time requires the pilot to plan ahead more in a large-mass airplane to make sure that the actions taken will achieve the final desired energy state. Additionally, the effects of commanded thrust changes on turboprop airplanes are much more rapid than on large turbofan airplanes. Airplanes are designed to be operated in well-defined envelopes of airspeed and altitude. The operational limits for an airplane - stall speeds, placarded maximum speeds/Mach number and maximum certificated altitudes - are in the AFM for each individual airplane. Within these limits, the airplanes have been demonstrated to exhibit safe flight characteristics. OEM and regulatory test pilots have evaluated the characteristics of airplanes in conditions that include inadvertent exceedances of these operational flight envelopes to demonstrate that the airplanes can be returned safely to the operational flight envelopes. Aside from gravity and thrust forces, the other forces acting on an airplane are generated as a result of the changing pressures produced on the surfaces that result in turn from the air flowing over them. Most force-generating surfaces on modern transport category airplanes are carefully tailored to generate lifting forces efficiently. Wings and tail surfaces all produce lift forces in the same way. 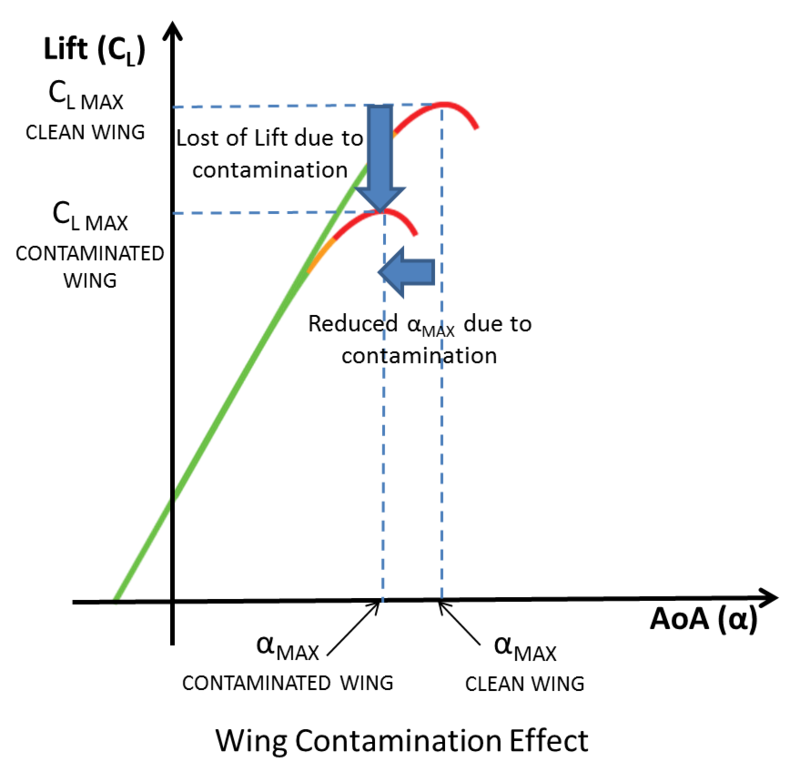 The figure below shows a cross section of a lifting surface and the familiar definition of angle of attack versus lift. The lift force generated by a surface is a function of the angle of attack, the dynamic pressure (which is proportional to the air density and the square of the true airspeed) of the air moving around it and the size of the surface. It is important to understand the dependence of lift on angle of attack. 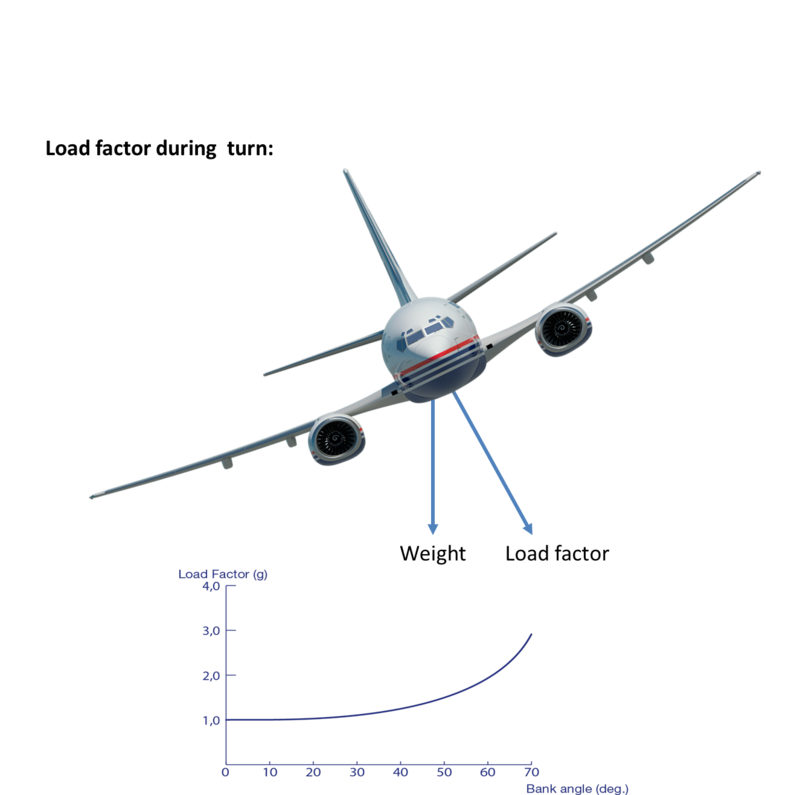 The figure below shows how lift varies with angle of attack for constant speed and air density. Important features of this dependency include the fact that at zero angle of attack, lift is not zero because most lifting surfaces are cambered. As angle of attack is increased, lift increases proportionally and this increase in lift is generally linear up to a point. At the critical angle of attack, the air moving over the upper surface can no longer remain attached to the surface, the flow breaks down and the surface is considered stalled. 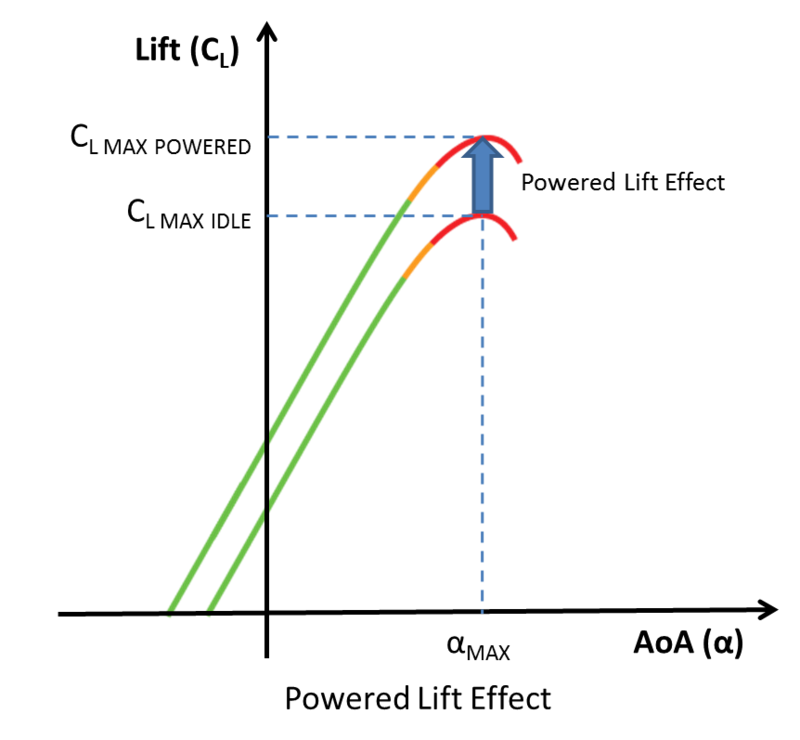 Wing shape influences the lift curve slope as illustrated in the figure below by the coefficient of lift CL. The steepness of the slope affects the rate at which lift changes due to angle of attack. Straight wing and swept wings behave differently at higher angles of attack in turn affecting stall behavior. For a straight wing, small differences in angle of attack produce notable changes in lift and potentially a quicker stall recovery when the angle of attack is reduced. Swept wings stall at higher angles of attack and the stall (g break) may not be so well defined. Stalls can be very difficult to identify on swept wing surfaces when no slats, flaps or landing gear are extended. It is necessary to understand that this breakdown of the flow and consequent loss of lift is dependent only on the angle of attack of the surface. Exceed the critical angle of attack and the surface will stall and lift will decrease instead of increase. This is true regardless of airplane speed or attitude or wing shape. To sustain a lifting force on the aerodynamic surfaces, the pilot must ensure that the surfaces are flown at an angle of attack below the stall angle. Depending on the context in which it is used, aerodynamicists use the term "angle of attack" in a number of ways. Angle of attack is always the angle between the oncoming air, or relative wind, and some reference line on the airplane or wing. Sometimes it is referenced to the chord line at a particular location on the wing; sometimes to an "average" chord line on the wing; other times it is referenced to a convenient reference line on the airplane, like the body reference x axis. Regardless of the reference, the concept is the same as are the consequences: exceed the critical angle of attack and the lifting surfaces and wind will separate, resulting in a loss of lift on those surfaces. Frequently the term "airplane angle of attack" is used to refer to the angle between the relative wind and the longitudinal axis of the airplane. In flight dynamics, this is frequently reduced to simply "angle of attack". There is not typically an angle-of-attack indicator in most commercial transport airplanes. These three angles and their relationships to each other are shown in the below figure. Pitch angle is the angle between the longitudinal axis of the airplane and the horizon. This angle is displayed on the attitude indicator or artificial horizon. 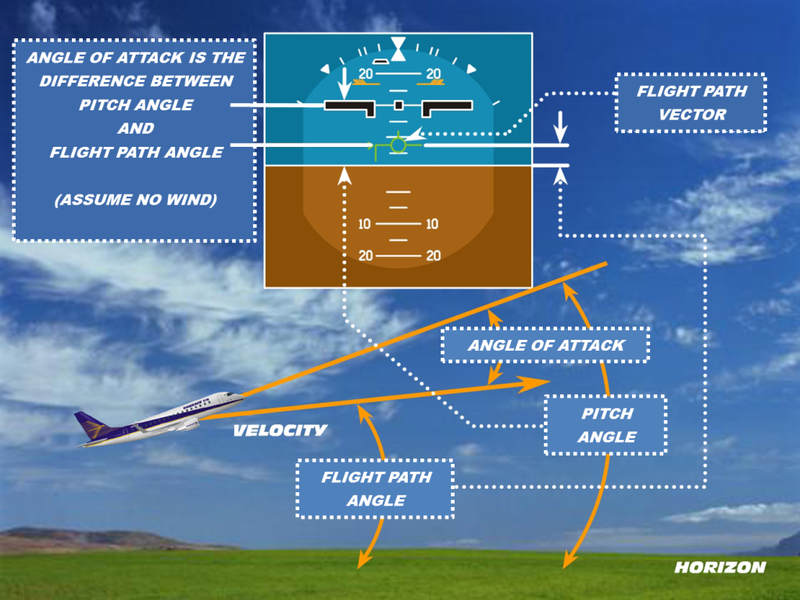 Angle of attack is the difference between the pitch angle (attitude) and the flight path angle with no wind component. The angle of attack determines whether the aerodynamic surfaces on the airplane are stalled or not. Flight path angle is the angle between the flight path vector and the horizon. This is also the climb (or descent angle). In Level Flight (FPA=0), the pitch attitude equals the angle of attack. 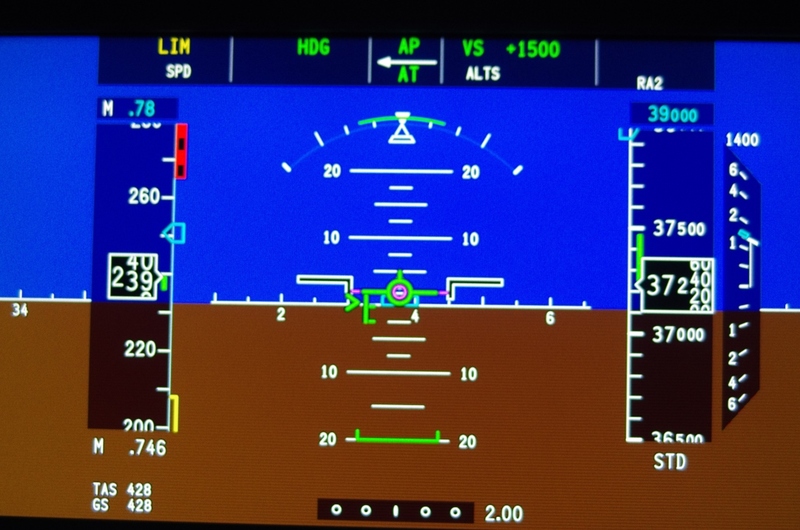 This angle can be displayed on the PFD or HUD, as depicted in above figure. An airplane wing can approach the stall angle of attack at any airspeed (beware that at airspeeds above design maneuver speed, VA or near maximum flap speeds VFE, the wing can generate enough lift to cause it to fail due to structural overload before reaching the stall angle of attack). An airplane can be stalled in any attitude. If the angle of attack is greater than the stall angle, the surface will stall. 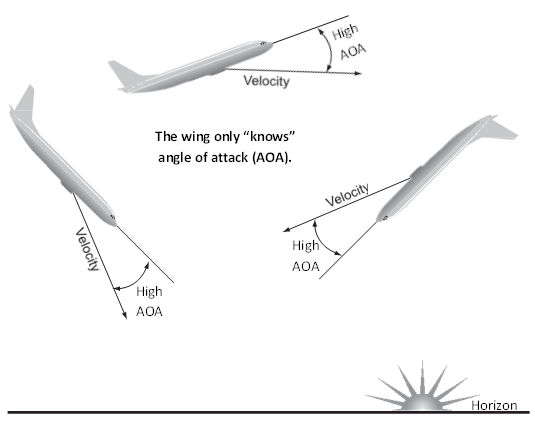 The figure below indicates that regardless of the airspeed or pitch attitude of the airplane, the angle of attack determines whether the wing is stalled. These characteristics are usually accompanied by a continuous stall warning and possibly stick pusher activation (if so equipped). A stall must not be confused with an approach-to-stall warning that occurs before the stall and warns of an approaching stall. 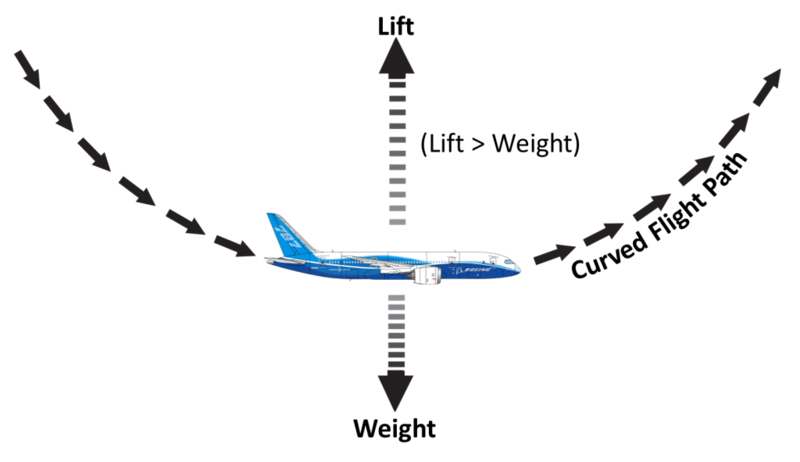 Stall speeds are published in the AFM for each transport airplane, giving the speeds at which the airplane will stall as a function of weight and flap angle. * The stall speeds published in the AFM are "power-off" speeds. The Indicated Airspeed at stall will decrease with increasing thrust or power as well as vary with the other stated factors (a-d). 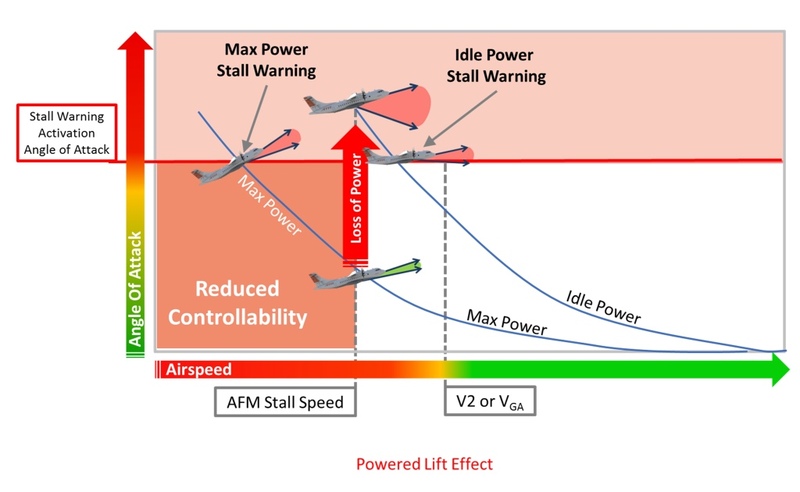 Turboprop pilots should also be aware that "powered lift" effect can result in activation of stall warning occurring at indicated airspeeds well below the published stall speeds, due to an increase in lift from slipstream flowing over the wing at all angles of attack (including the angle of attack for stall warning). The effect of thrust or power on stall speeds cannot be used in considering the minimum acceptable speed during any phase of flight. Most upsets are quite dynamic in nature and involve elevated load factors and large speed-change rates. Pilots should not expect the airplane to remain unstalled just because the indicated airspeed is higher than AFM chart speeds, because the conditions may be different. All transport category airplane are certified to exhibit adequate warning of impending stall to give the pilot opportunity to recover by decreasing the angle of attack. Whether this warning is by natural aerodynamic buffet or provided by a stick shaker or other warning devices, it warns the pilot when the angle of attack is getting close to stall. The warning is required to be in a form other than visual. The pilot need not look at a particular instrument, gauge or indicator. The warning is tactile or by sound: the pilot is able to feel or hear the stall warning with enough opportunity to recover promptly. Pilots need to be especially cognizant of stall warning cues for the specific airplanes they fly. Any stall warning should be taken as an indication to decrease the angle of attack unless otherwise indicated by an OEM procedure. The angle of attack at which a wing stalls also reduces with increasing Mach so that at high Mach (normally, high altitude), an airplane will stall at an angle of attack that is less than the angle of attack for stalling at lower Mach numbers. Aerodynamically, anti-symmetric flight, or flight in sideslip, can be quite complex. The forces and moments generated by the sideslip can affect motion in all three axes of the airplane. Sideslip can generate aerodynamic rolling moments as well as yawing moments. Inappropriate rudder inputs will aggravate the situation. Extreme care must be taken whenever a pilot chooses to use rudder to correct sideslip. 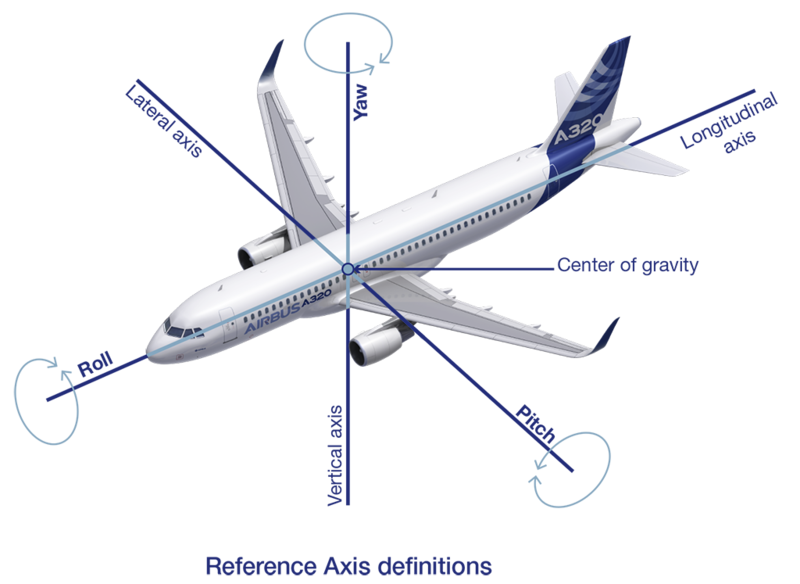 Sideslip angle is the angle between the longitudinal axis of the airplane and the relative wind (see figure below). It is a measure of whether the airplane is flying straight into the relative wind. With the exception of crosswind landing considerations requiring pilot-commanded sideslip, transport airplanes are typically flown at or very near zero sideslip. This usually results in the lowest cruise drag and is most comfortable for passengers, as the sideways forces are minimized. When a sideslip angle is developed, the vertical tail is at an angle of attack and generates "lift" that points sideways, tending to return the airplane to zero sideslip. Airplanes that are certificated to exhibit static directional stability will return the airplane to zero sideslip when controls are released or returned to a neutral position. In order to hold a sideslip condition, the pilot must hold the rudder in a deflected position (assuming symmetrical thrust). 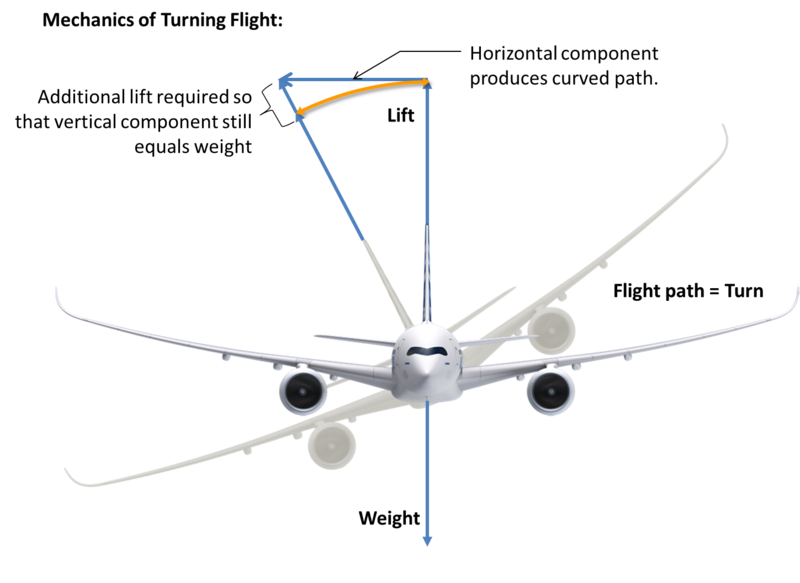 Dihedral is the positive angle formed between the lateral axis of an airplane and a line that passes through the center of the wing, as depicted in the figure below. Dihedral contributes to the lateral stability of an airplane. A wing with dihedral will develop stable rolling moments with sideslip. If the relative wind comes from the side, the wing into the wind is subject to an increase in lift. The wing away from the wind is subject to a decrease in angle of attack and develops a decrease in lift. The changes in lift create a rolling moment, tending to raise the windward wing; hence, dihedral contributes a stable roll due to sideslip. Since wing dihedral is so powerful in producing lateral stability, it is used as a "common denominator term" of the lateral stability contribution of other airplane components, such as rudder and wing sweep. In other words, the term "dihedral effect" is used when describing the effects of wing sweep and rudder on lateral stability and control. Rudder input produces sideslip and contributes to the dihedral effect. The effect is proportional to the angle of sideslip. (That is, roll increases with sideslip angle; therefore, roll increases with increasing rudder input.) Precise control of roll angle using this technique is very difficult and therefore, not recommended. The next section discusses this area in more detail. 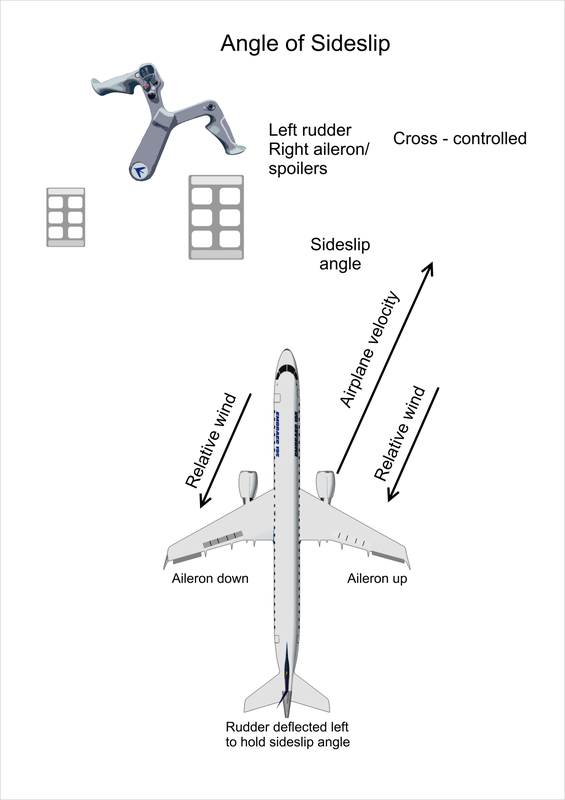 When an airplane is at a high angle of attack and the airplane is approaching a stall, the aileron and spoiler roll controls become less effective. At the stall angle of attack, the rudder is still effective; therefore, it can produce large sideslip angles, which in turn produces roll because of the dihedral effect. It is worth recalling from primary flight training, that this is how an airplane enters a spin. The rudders on transport airplanes are sized to counter the yawing moment associated with an engine failure at very low takeoff speeds and to conduct crosswind takeoffs and landings, using up to maximum pedal input. An excessive rudder input can produce a large sideslip angle, which will generate a rolling moment that requires significant lateral control input to stop the airplane from rolling. The rudder should not normally be used to induce roll through sideslip because the result can be rapid roll rates after significant time delays from the initial input. The overreaction can induce abrupt yawing moments and violent out-of-phase roll rates, which can lead to successive cyclic rudder deflections, known as rudder reversals as the pilot tries to control the resulting motions. Large aggressive control reversals induce loads that can exceed structural design limits. Except in crosswind takeoff and landing, keeping the sideslip as close to zero as possible will ensure that the maximum amount of lateral control is available for maneuvering. Rudder should only be used in combination with ailerons/spoilers to eliminate sideslip, not create it. Pilots should develop a feel for the particular airplanes they fly and understand how to minimize sideslip angle through coordinated use of flight controls. Crossover speed is a term that describes the lateral controllability of an airplane with the rudder at a fixed (up to maximum) deflection. -It is the minimum speed (weight and configuration dependent) in a 1-g flight, where maximum aileron/ spoiler input (against the stops) is reached and the wings are still level or at an angle to maintain directional control. Any additional rudder input or decrease in speed will result in an unstoppable roll into the direction of the deflected rudder or in an inability to maintain desired heading. Crossover speed is very similar in concept to VMCA, except that instead of being VMCA due to a thrust asymmetry, it is VMCA due to full rudder input. This crossover speed is weight and configuration dependent, while also sensitive to angle of attack. With weight and configuration held constant, the crossover speed will increase with increased angle of attack and will decrease with decreased angle of attack. Thus, in an airplane upset due to rudder deflection with large and increasing bank angle and the nose rapidly falling below the horizon, the input of additional nose-up elevator with already maximum input of aileron/spoilers will only aggravate the situation. The correct action in this case is to unload the airplane to reduce the angle of attack, which will regain aileron/spoiler effectiveness and allow recovery. This action may not be intuitive and will result in a loss of altitude. Propellers provide quick thrust build-up compared to jet engines which spool up and generate thrust more slowly. Propeller effects have the positive benefit of allowing the turboprop pilots to correct airspeed or flight path deviations with less anticipation and more accuracy than their jet counterpart. Propeller effects, however, can introduce rolling moments and unwanted slip or skid in response to power changes that require pilot compensation and close attention to airplane trim. Knowledge of those effects will ensure pilots control their aircraft in an effective manner. Lacking such effects, jet transports track straighter and require less attention to rudder for yaw control. In fact, the most-welcome discovery in the transition from a turboprop to a jet is the absence of the footwork associated with a prop and the lack of directional trim change due to speed changes that propeller effects require. This also is a risk when transitioning to a jet powered airplane, where rudder inputs could aggravate rather than assist in certain situations. Anytime, asymmetry exists due to power effects sufficient coordinated rudder and lateral inputs will be required to maintain the desired flight path. Asymmetric propeller loading is the result of dissimilar thrust from rotating propeller blades during certain flight conditions. Downward moving propeller blades have a greater local angle of attack than upward moving blades when the relative airflow striking the blades is not aligned with the thrust line. In conventional engines where the propeller rotates clockwise when viewed from the rear, asymmetric propeller loading results in the center of thrust shifting to the right of the propeller's centerline. As a result, the yaw moment of the right engine is greater than the corresponding one of the left engine (see figure below). The effects of asymmetric propeller loading are most pronounced when engines are operating at a high power setting and the airplane is flown at high angles of attack (low speeds). In the event of an engine failure on any airplane with wing-mounted engines, there is a yawing motion into the inoperative engine as a result of asymmetric thrust which must be controlled by an appropriate rudder deflection. 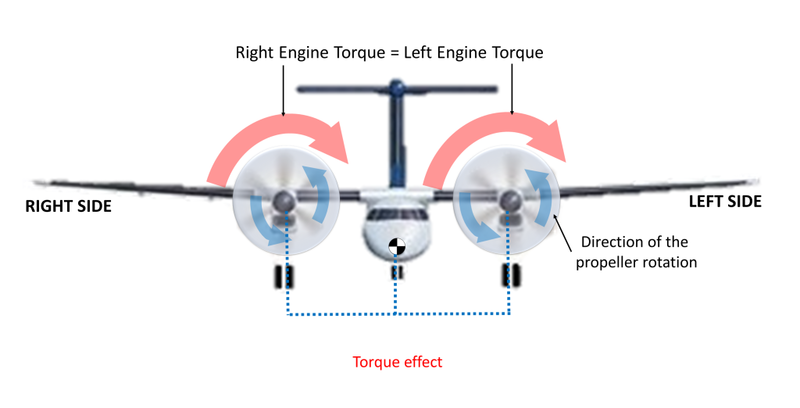 As a result of asymmetric propeller loading, directional control may be more difficult when the left engine is suddenly made inoperative than when the right engine is suddenly made inoperative. In this case, the left engine is termed the "critical engine". Some airplane types are designed to have more rudder deflection to the right than to the left in order to counter this effect in which case, neither engine is considered to be critical. At high engine power, the air moving through the propellers is accelerated in order to produce the thrust. This also increases the local velocity of air flowing over the parts of the wing behind the propellers which generate more lift at a given airspeed. The accelerated flow behind the propeller also causes a rolling phenomenon that is the result of asymmetric propeller loading. 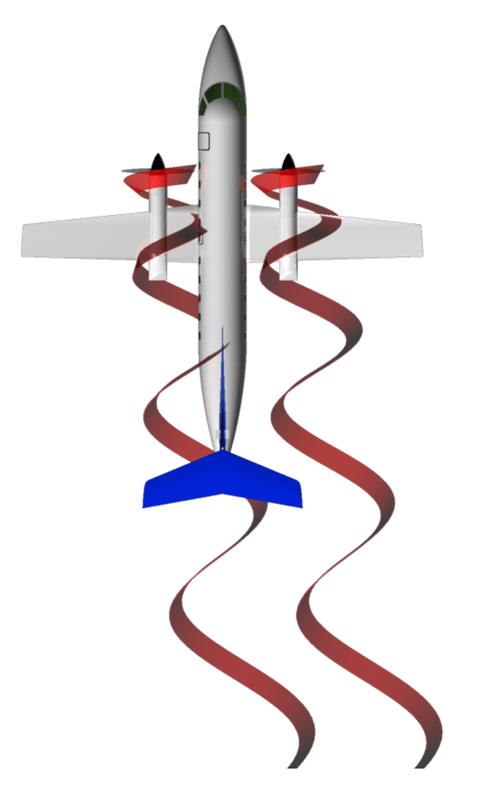 As shown in the figure below, when the center of thrust shifts right as the angle of attack is increased, the accelerated air behind the propeller shifts in a similar fashion. 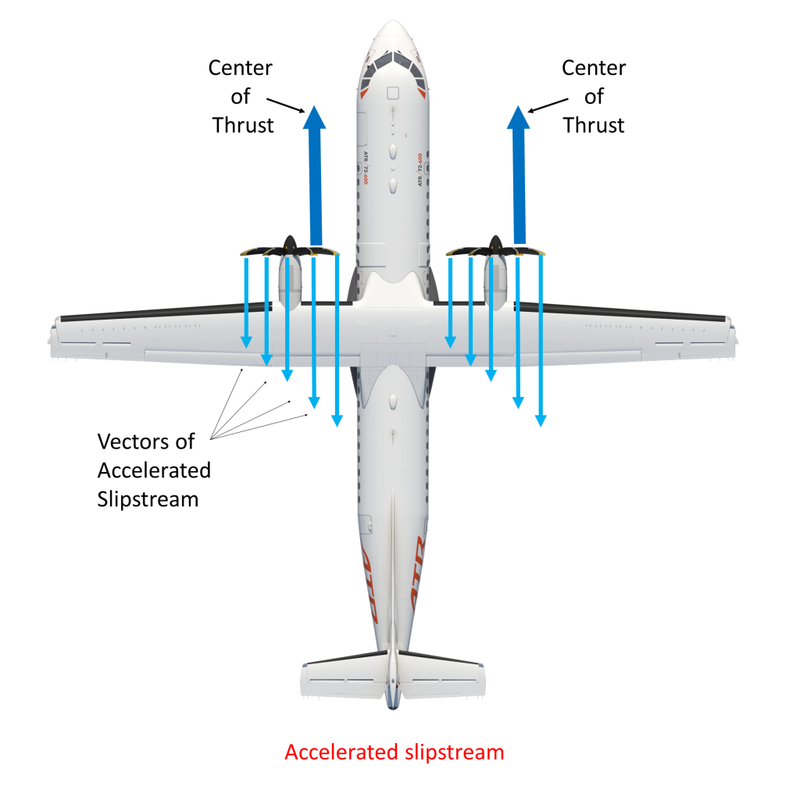 The center of lift shifts in the direction of the greater accelerated slipstream, as illustrated in the figure below, as viewed from the rear of the airplane. The center of each wing produces a rolling moment around the center of gravity. In addition to the yawing moment due to asymmetric propeller loading, the turboprop airplane also experiences a rolling moment toward the failed engine which occurs when the wing with the failed engine experiences a reduction in lift due to the lost accelerated slipstream. This requires immediate application of lateral control to maintain wings level flight. Due to the strong asymmetric lift effects after an engine failure, minimum control speed is a critical case for the sizing of the lateral controls for turboprop airplanes. A propeller normally keeps rotating following an engine failure or when engine power is reduced to idle and the propeller blades tend to stay at their low-pitch stops with the propeller being back-driven by the flow of air through the propeller- a condition known as "windmilling". disrupts the airflow over the affected section of the wing, reducing lift on that wing in the opposite manner to effect of accelerated slipstream. In a one-engine inoperative condition during take-off, airplane controllability and climb performance capability are based on the assumption the propeller of the failed engine is feathered and the airspeed is maintained at or above the minimum airspeeds defined in the AFM. Transport category turboprops have propellers equipped with automatic feathering systems which are capable of setting the blades at an angle that minimizes propeller drag and disruption to the airflow behind the propeller. As described above, at high engine power, the air moving through the propellers is accelerated in order to produce the thrust. This also increases the local velocity of air flowing over the parts of the wing behind the propellers which generate more lift at a given airspeed. This can be an important advantage over jet airplane during the approach phase of flight. Low airspeed or excessive sink rates that require only a small power increase for quick correction in a turboprop become more critical in jets where speed control and engine thrust management require greater anticipation. Powered lift effect reduces the airplane angle of attack required to maintain a constant flight path at a given airspeed. However, turboprop pilots must be aware of some side-effects of the powered lift effect. Stall warnings are based on angle of attack thresholds with engine at idle. At high power settings the enhanced lift generated by the parts of the wings behind the propellers will reduce the angle of attack for the same airspeed. This results in an increased margin above the stall angle of attack. This can result in stall warning occurring at airspeeds lower than those published in the AFM when the airplane is operating at hight power settings. The consequence of attempting to fly at airspeeds below AFM minimum speeds (V2 or VGA) at high power will be reduced control effectiveness and the potential for a very abrupt stall in the event the stall angle of attack is exceeded or engine power is lost. 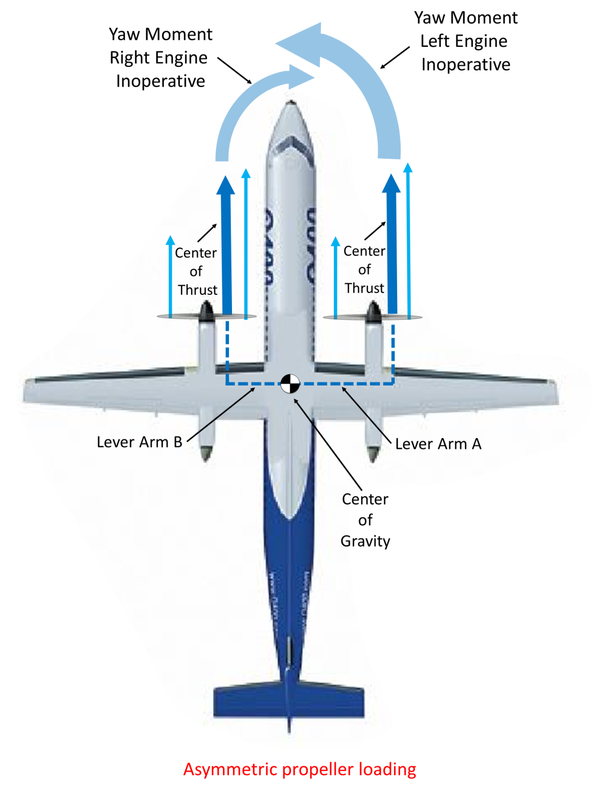 While turboprop airplanes are generally more tolerant to low airspeed because of powered lift, when combined with an engine failure, this margin disappears and the airplane can stall and roll abruptly due to the resulting lift asymmetry. As a consequence, turboprop pilots must adhere to the applicable minimum speeds to avoid inadvertently allowing the airplane to slow to airspeeds below published stall speeds. 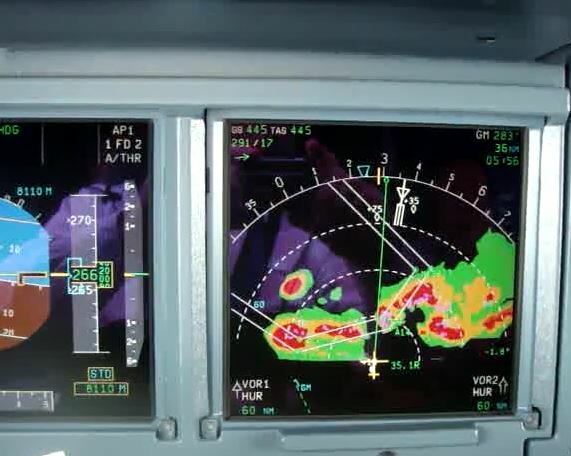 In the event of windshear, pitch attitude can be increased, while respecting the AFM minimum speeds. If these speeds are not adhered to, the effects of powered lift may result in flying at airspeeds well below the AFM minimum speed without stick shaker or stick pusher activation. This is a critical difference between a turboprop airplane and a jet airplane. In addition, optimum climb performance occurs near the nominal V2 or VGA airspeed for the flap configuration [refer to 6.5.1. L/DMAX]. At airspeeds below these values, the airplane will be operating on the "back side" of the Lift/Drag curve with a significant deterioration of climb capability. Additionally, the flight controls may not have sufficient authority to maintain control of the airplane in turbulence. Propeller slipstream refers to the accelerated airflow present in the wake of the propellers. As a spinning propeller produces thrust, it also imparts a spin and a lateral displacement to the airflow behind it - referred to as slipstream "swirl" or "spiraling". 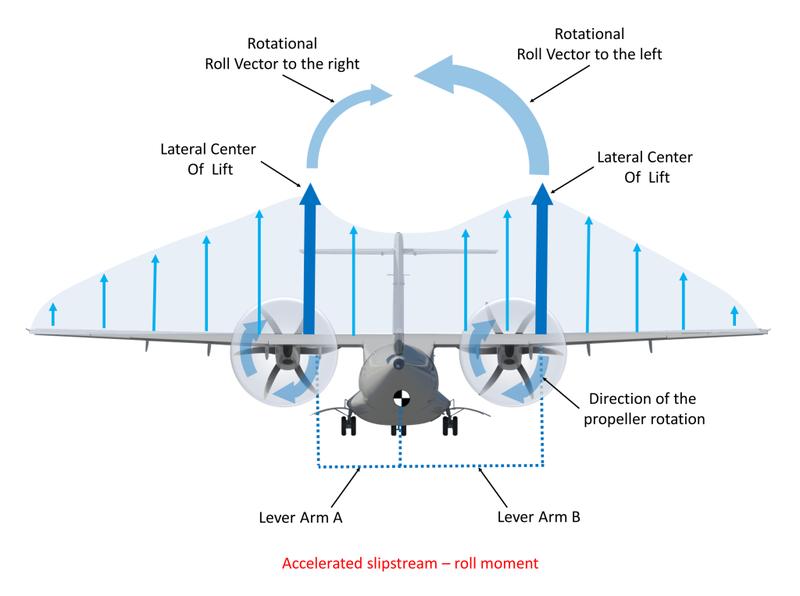 If the propellers rotate clockwise (when viewed from the rear), the wake from the left propeller is displaced inboard with the result that the flow immerses the aft portion of the fuselage and tail in slipstream, as illustrated in figure below. As the propeller slipstream flows around or near the tail of the airplane, it affects the horizontal and vertical stabilizers and control surfaces. Slipstreams can alter the angle of attack and dynamic pressure at the horizontal tail changing the magnitude of the lift produced by the tail - this effect can be particularly strong on "tail low" designs that are always immersed in the slipstream. The pilot must counter any change in airplane pitching moment that results from a power change by adjusting the lift on the tail with elevator then re-trimming the airplane for the new balanced condition. Changes in slipstream with changes to engine power settings also affect the local angle of sideslip at the vertical stabilizer. This results in side forces that create overall sideslip for the airplane and may affect the rudder pedal feel characteristics for airplane with un-powered rudders. To compensate for this and return the airplane to a zero sideslip condition, it is always necessary to make small rudder trim adjustments whenever large engine power adjustments are made. Torque effect is the reaction to the torque produced by the engines that imparts a rolling moment to the airplane, in the opposite direction to the propeller rotation. If propeller rotation is clockwise when viewed from the rear, the torque reaction will try to roll the airplane left (see figure below). Positive static stability is defined as the initial tendency to return to an undisturbed state after a disturbance (Fig. 29). All transport airplane demonstrate positive static stability in at least some sense. The concept of stability can apply to a number of different airplane parameters that will be discussed later in this document. It is important that pilots understand their airplane's feel and response characteristics to flight control inputs. In straight and level un-accelerated flight, the load factor is 1G. Any maneuvering in pitch or roll will either increase or decrease the load factor from 1 g. This increase or decrease will impact maneuver capability and stall margin. Movement about the lateral axis is called "pitch", as depicted in figure here-above. The pilot controls pitching motion (and therefore the angle of attack) by means of the elevator. The elevator is the primary control in pitch. The trim system of an elevator or horizontal stabilizer is the secondary control to reduce the need for the pilot to hold constant force. Pitching about the center of gravity changes the airplane angle of attack. Maneuvering in pitch, also changes the Load Factor. Movement about the longitudinal axis is called "roll". The ailerons (and roll spoilers) are the primary controls in roll. The result of increasing bank (rolling) is a re-orientation of the lift vector from the vertical, which in turn creates a horizontal lift component as well as a reduced vertical lift component. The result of this imbalance of forces is a curved descending flight path. Movement about the vertical axis is called "yaw". Airplanes are certified to withstand a full scale rudder deflection from neutral, in one direction. Reversing the rudder from one direction to another is not considered in certification and can result in excessive structural loads, even at slow airspeeds. It is important to emphasize that rudder limiters do not protect against the structural loads or excessive sideslip angles that can be generated from rapid rudder reversals at any airspeed. The rudder is the primary control in yaw. The rudder is intended to be used to control yaw in two ways, either to minimize the angle of sideslip or to create yaw to correct for crosswind during take-offs and landings. The rudder is not intended to be used as a primary roll control. Pilots should be completely aware that experience on non-transport category airplane which emphasizes use of rudder input as a means to maneuver in roll does not apply to transport category airplanes. However, when all normal means of roll control have been unsuccessful, careful rudder input in the direction of the desired roll should be considered to induce or augment a rolling maneuver or to provide the desired bank angle. The objective of all maneuvering is to manipulate the forces on the airplane in order to orient the flight path. Understanding effects of Load Factor is critical to properly understand the mechanics and performance of maneuvering Flight. Load factor (n) is a measure of loads on the airplane structure during flight. Load factor is referred to in terms of acceleration of gravity or "g" value. When the wing is producing lift equal to 1 times the weight of the airplane, it is oriented in a direction opposed to the gravity vector and is referred to as a load factor of 1g. During maneuvering, the load factor will be either greater or less than 1g. In a pull-up, the wing generates lift greater than the weight of the airplane and the load factor is above 1g (see figure below). In a turn, the result of increasing bank (rolling) is a re-orientation of the lift vector from the vertical, which in turn decreases the vertical lift component. Acceleration due to gravity still points toward the Earth, therefore an imbalance in the vertical forces develops. Unless lift is increased so that its vertical component equals the weight of the airplane, the airplane will begin to accelerate toward the Earth - it will begin to descend. To maintain altitude in a banked turn, the lift produced by the airplane must be more than the weight of the airplane. The increase of lift required is a function of bank angle and therefore the load factor will increase (see figure below). Modern jet transport airplanes are designed to fly at very high altitudes, and as a purely practical matter, it is useful to identify high altitude operations as those above FL250. This training aid therefore uses the same threshold. While aerodynamic principles and certain hazards apply at all altitudes, they become particularly significant with respect to loss of control (or upset) at altitudes above FL250. It is important to be aware of temperature changes throughout the operational flight envelope, because the speed of sound (represented as Mach number) is a function only of temperature. Temperature decreases with altitude until the tropopause, while above that, it remains relatively constant. Aerodynamic characteristics of lifting surfaces and airplanes are significantly affected by the relationship of airspeed to Mach. At high altitudes, high Mach numbers exist at relatively low calibrated airspeeds. Pilots need to be aware of the Mach number and altitude effects on the stability and handling qualities of their airplanes, and need to know that maneuvering an airplane at traffic pattern altitudes is different than maneuvering at the same calibrated airspeed at cruise altitude. Resulting forces of flight control inputs at traffic pattern altitudes are different from the same flight control inputs at the same calibrated airspeed at high altitudes. At a constant airspeed (Vc), elevator deflection at 35,000 ft will result in a higher pitch rate than the same elevator deflection at 5,000 ft because there is less aerodynamic damping. Therefore, the change in angle of attack is greater, creating more lift and a higher load factor. For a given pitch attitude, the change in rate of climb or descent is proportional to the true airspeed. A pitch attitude at 290 kt EAS at sea level that results in 500 ft per minute (fpm) will generate about 900 fpm at 35,000 ft (290 kt EAS at 35,000 ft is approximatively 490 kt TAS). This characteristic is true even for small attitude changes, such as used to hold altitude. It is also why smooth and small control inputs are required at high altitude, particularly when disconnecting the autopilot. Because exceeding operating limits can occur for various reasons, all modern transport airplanes are tested to determine that only normal piloting skills are needed to recover back to the normal operational flight envelope. As altitude increases, air density decreases, and when this occurs, natural aerodynamic damping decreases and the airplane becomes more responsive to control inputs. Aerodynamic damping is a function of the relative speed of the airplane to the airstream and of the air density and can be related back to the true airspeed (TAS) of the airplane. Increasing indicated airspeed results in a higher TAS and less damping, or, for a given indicated airspeed , increasing altitude results in a higher TAS and less damping. As mentioned above, altitude and Mach number change the aerodynamic characteristics of the airplane - so it does "feel" and respond differently at different altitudes. It is imperative to not over- react with large and abrupt inputs. Higher Mach numbers may also adversely affect the stability of the airplane, causing undesirable characteristics to develop or worsen. As Mach number increases, airflow over parts of the airplane begins to exceed the speed of sound. Shock waves associated with this local supersonic flow can interfere with the normally smooth flow over the lifting surfaces, causing local flow separation and buffet. Most turboprop airplanes operate at lower maximum altitudes and speeds than jet transport airplanes. At higher altitudes, air density decreases to the point where aerodynamic characteristics of propellers, lifting surfaces and airplanes are significantly affected by the relationship of airspeed to the speed of sound (Mach effects). To avoid these effects, the maximum operating altitude and airspeeds for turboprop transport designs are chosen to ensure that the effects of altitude on inflight operating characteristics are minimized. As a result of their lower ceiling, turboprops will experience little or no change in stability and flying qualities caused by the reduction in aerodynamic damping (due to decreased atmospheric density). The lowest point on the total drag curve (as indicated in figure below) is known as L/DMAX (or Vmd - minimum drag speed). The speed range slower than L/DMAX is known as slow flight, which is sometimes referred to as the "back side of the power-drag curve", "region of reverse command" or "second regime". 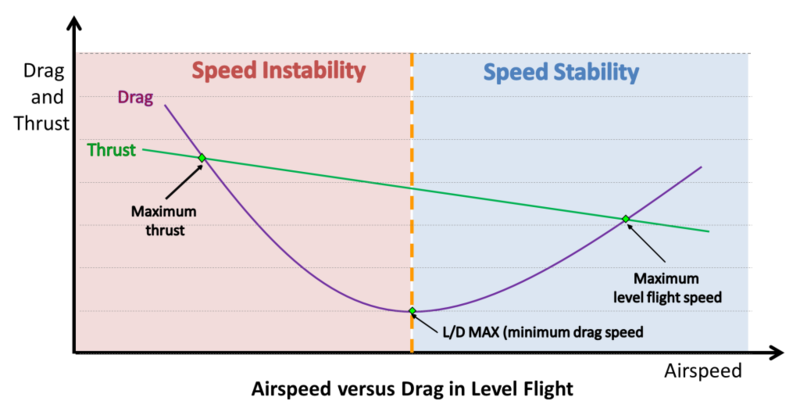 Speed faster than L/DMAX is considered normal flight, or the "front side of the power-drag curve" or "first regime". Flight faster than L/DMAX is inherently stable with respect to speed. When operating in level flight at a constant airspeed with constant thrust or power setting, any airspeed disturbance (such as turbulence) will result in the airspeed eventually returning to the original airspeed. Flight slower than L/DMAX is inherently unstable with respect to speed and thrust/power settings. When operating at a constant airspeed with constant thrust/power setting, any disturbance in the second regime causing a decrease in airspeed will result in a further decrease in airspeed unless power is increased. Figure 39 shows that lower speed will result in increased drag. The increase in drag will cause a further decrease in airspeed, which may ultimately result in a stalled flight condition. Flight slower than L/DMAX at high altitudes must be avoided. When operating slower than L/DMAX, and where total drag exceeds total thrust or power, the airplane will be unable to maintain altitude and the only remaining option to exit the slow flight regime is to initiate a descent. Many factors can cause airspeed decay. These include, changing winds or temperature increased drag during turns, turbulence, icing, use of anti-ice, auto-throttle or engine malfunctions etc. Fuel efficient flight profiles may require high altitude cruise at lower speed or Mach numbers resulting in less time to recognize and respond to speed deterioration at high altitude. Slow reacting auto-throttles, designed for passenger comfort, may not apply thrust quickly enough to prevent a slowdown below L/DMAX. Undetected, any speed decay is an undesired airplane state. Proper flight planning, adherence to published climb profiles, cruise speeds and a flight crew actively monitoring the flight will ensure that speeds slower than L/DMAX are avoided. Optimum altitude for a weight and atmospheric conditions are based upon air temperature and operating speed margins. Therefore, temperature must be monitored when operating close to L/DMAX to ensure performance is maintained. Airplane manuals and flight management systems provide optimum climb speeds. When increased rates of climb are required, the crew must ensure the speed is not decreased below L/DMAX. 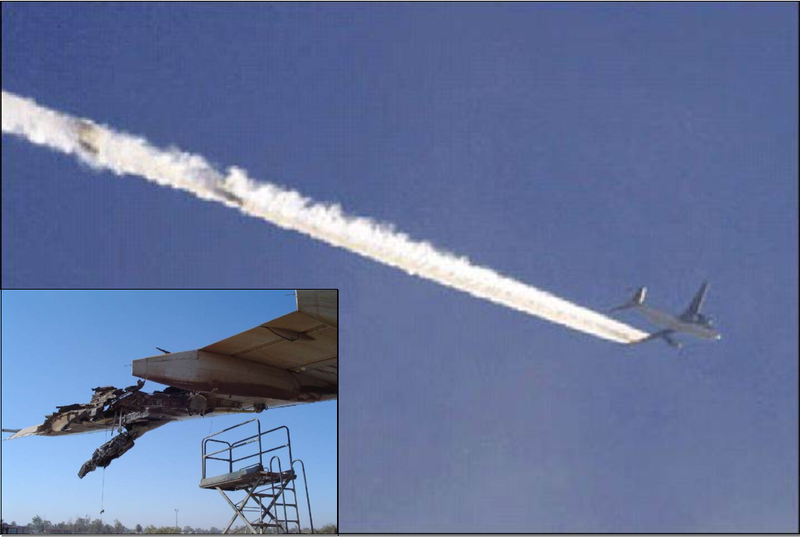 On some airplane types, minimum climb speeds may be higher when operating in icing conditions to ensure adequate airspeed margins are maintained with contamination on the lifting surfaces. Inappropriate use of the autoflight system V/S mode causes many slow speed events during high altitude climbs. Pilots must be aware that when using V/S mode, the selected V/S takes precedence over selected Airspeed/Mach, hence an excessive V/S climb will result in a speed decay that will not be stopped until the pilot or autoflight system intervenes. Maximum altitude is the highest altitude at which an airplane can be operated. Maximum Certified Altitude - the maximum altitude due to structural considerations or other certification requirements. Thrust or Power Limited Altitude - the altitude at which sufficient thrust/power is available to provide a specific minimum rate of climb. Buffet or Maneuver Limited Altitude (jet airplane) - the altitude at which a specific maneuver margin exists prior to buffet onset. When operating at Maximum Altitude for an airplane type, the margins are at the minimum required by regulation resulting in reduced bank angle capability; therefore, autopilot or crew inputs must be kept below buffet thresholds. The airplane that is initially within the buffet limits could end up with insufficient thrust to maintain the necessary airspeed due to environmental or maneuvering changes. This is a common item in many high altitude situations where airplanes slow down to the lower buffet limits. When operating near the maximum altitude in unstable atmospheric conditions, speed and angle of attack have minimum margin to cope with environmental changes. This could lead to a slowdown or stall and subsequent high altitude upset. When temperature increases, the maximum altitude capability decreases significantly. This is a situation where maneuver buffet margins are adequate but temperature is affecting thrust capability to sustain airspeed at the higher altitudes. In the event of a thrust/power loss, the airplane may suddenly change from a condition of sufficient thrust/power for the operating altitude to a condition of flying above the Thrust or Power Limited altitude. If a "drift down" is not initiated, the airspeed will decrease and the airplane will enter an upset. Pilots must be aware of the effects on handling qualities resulting from different center of gravity. An airplane loaded toward the forward center of gravity limits will be more stable, while an airplane loaded toward the aft center of gravity limits will be less stable. The more stable an airplane becomes, the less maneuverable it will be. Conversely, the less stable an airplane becomes, the more maneuverable it will be. This is most noticeable the closer the airplane is loaded to the center of gravity limits. With an aft center of gravity, less force is required by the tail to counteract the nose down pitching moment of the wing. This results in less induced drag and more efficient flight. For this reason, aft center of gravity loadings are usually planned to achieve less fuel burn. An aft center of gravity loaded airplane will be more responsive and consequently more sensitive to pitch control inputs. With a forward center of gravity, the elevator control authority to raise the nose of the airplane is reduced. airplane without a trimmable horizontal stabilizer and loaded at forward center of gravity will require more pilot force to produce nose up pitch. This is particularly noticeable at take-off and landing. An airplane that is outside the weight and balance envelope can result in airplane handling that can be unpredictable. The problem may be exacerbated at high altitude. MMO and/or VMO define the maximum operating speed for each airplane type. VMO is defined by the maximum loads that the airframe is designed to withstand in response to atmospheric gusts, turbulence or maneuvering by the pilot. Exceeding VMO or MMO can occur for various reasons and all transport airplane are designed to allow for minor exceedances and the use of normal piloting skill to recover back to the normal operational flight envelope. It is imperative to not over-react to an airspeed exceedance with large and drastic inputs in order to avoid placing large maneuvering loads on the airframe. Pilots should smoothly adjust pitch and/or power to reduce speed should an overspeed occur. There is no need to immediately disconnect a correctly functioning autopilot if the AFS is commanding a return back to the normal flight envelope (unless OEM procedures dictate otherwise). Inadvertent airspeed excursions above VMO/MMO should be treated very seriously. Flight at very high airspeeds puts the airplane in a region of reduced protection from gusts, turbulence or structural loads. Flight at very high Mach numbers puts jet airplanes in a region of reduced maneuvering envelope. During certification, all transport airplanes have been shown to exhibit safe operating characteristics during specified exceedances of airspeed or Mach envelopes. This means that the controls will operate normally and airplane responses are positive and predictable for these conditions. At very high airspeeds, very high control power exists. The airplane reaction to a fixed control deflection is significantly greater at high speeds than at low speeds. Care must be taken to remain inside the maneuvering envelope to avoid exceeding structural limits. At any speed, large aggressive control deflection reversals can lead to loads that can exceed structural design limits. In-flight icing is a serious hazard. By disturbing the smooth flow of air on the airplane, icing will increase drag, decrease the ability of an airfoil to produce lift and degrade control authority. 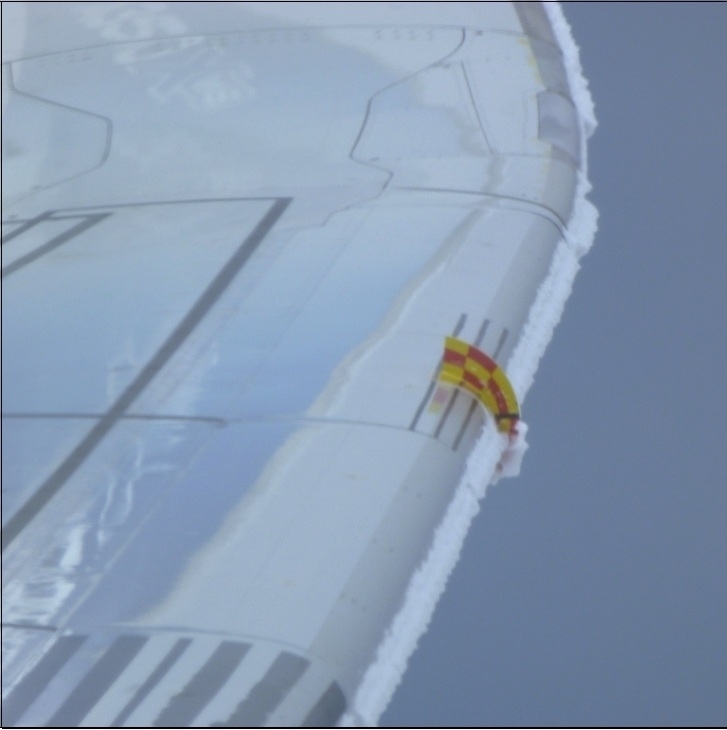 The lift distribution characteristics along the wing may be affected by even trace amounts of ice contamination. During the progression of a stall condition, flow separation on the contaminated aerofoil may be affected and the pitch and/or roll characteristics may be different from those of an uncontaminated wing. Until the angle of attack is reduced below the stall angle, pitch and roll excursions could be extreme. Transport category airplane are certified to operate in a wide range of icing conditions. Pilots must understand, however, that any amount of ice accretion on the lifting surfaces has a detrimental effect on the airplane. When operating in icing conditions, they must use ice protection systems as required by the procedures contained in the airplane Flight Manual and adhere to minimum airspeeds (if applicable) to ensure the airplane remains in the demonstrated operational flight envelope. Ice protection systems on transport category airplane generally operate on one of two principles - de-icing or anti-icing. De-icing systems are designed to remove ice after it has begun to accumulate on the airplane. Because some residual ice continues to adhere between system cycles, the surface is never entirely aerodynamically "clean". The effects of the residual ice are evaluated during certification and AFM procedures published to ensure acceptable handling and performance characteristics are retained. Anti-icing systems are designed to keep the protected areas of a surface entirely free of ice during an icing encounter. Anti-icing systems can be evaporative or "running wet". On a running wet anti-icing system, liquid water may run back to colder areas behind the protected areas and re-freeze - commonly referred to as "run back" ice. The effects of these accretions are evaluated for certification. Note that runback ice can serve as accretion sites for additional accumulations in an extended icing encounter, and these accumulations may exceed the amount and position of ice demonstrated during certification. Melting ice particles can also be a source for runback ice on surfaces protected by thermal anti-ice systems or can result from aerodynamic heating on the leading edge for an airplane operating at high airspeeds. If the temperature at the stagnation point on the leading edge is high enough, impinging ice particles may melt upon impact and then run back to colder areas behind the protected areas and refreeze. "Run back" ice will continue to affect the airplane after the protected surface ahead of the ice formation is clear of ice. The only way to remove "runback" ice is to find warm air conditions significantly above freezing to allow the ice to melt. While transport category airplane are certified to operate in icing conditions defined by the certification process, there are icing conditions that may exceed the certification criteria. Flights in freezing rain, freezing drizzle or certain mixed icing conditions may encounter water droplets that are larger than those defined in certification criteria and are referred to as super-cooled large water droplets (SLD). An SLD encounter may rapidly exceed the capability of the ice protection system and lead to ice build-up on protected surfaces or run back ice forming aft of the protected surfaces. Ice encountered in SLD conditions may seriously degrade the performance and controllability of the airplane. 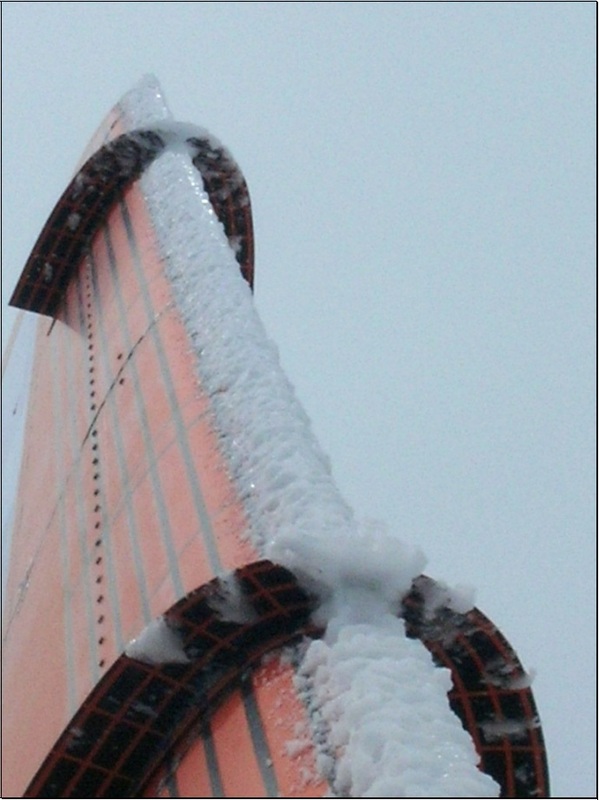 Super-cooled Large Droplet icing may be identified by unusually extensive ice accreted on the airframe in areas not normally observed to collect ice such as the aft portion of an un-heated engine or propeller spinner, wing surfaces aft of the protected area or ice accreted on the aft portions of the side windows of the flight compartment. Droplets that splash or splatter on impact at temperatures below +5°C outside air temperature. Flight crews encountering SLD icing must immediately follow any special procedures published in the AFM to ensure the airplane is operated in the correct configuration and alter their flight path to exit those conditions. Flight crews must also be especially wary of automation during icing encounters. Autopilots can mask the effects of airframe icing and consequent changes in performance and handling qualities which can contribute to ultimate loss of control. Transport category turboprop airplanes are certified to be safely operated in icing conditions. They are equipped with anti-icing and de-icing systems that provide protection against the effects of icing. The Turbo-prop transport airplanes generally employ pneumatic boots to de-ice the airplane wings and tail surfaces which allow for the collection of ice between inflation cycles of the boots to remove the accumulation. This accumulation of ice consists of "inter-cycle" ice which is the ice that collects on the surface between boot inflation cycles and "residual" ice which is the ice that is not completely removed after the boot inflates. It was believed to be necessary to delay operation of pneumatic boots until a significant accumulation of ice was noted on the airframe - in some cases it was common practice to wait until the airplane had accumulated 1/4 to 1/2 inch of ice. This was intended to prevent the phenomenon of "ice bridging" where ice would continue to collect while the boot was inflated. It has been demonstrated in flight test trials that Transport Category airplane pneumatic boot designs certified to current requirements, are not susceptible to ice bridging and may be turned on and allowed to cycle even before the first signs of ice accumulation are evident. Environmental conditions may exist in which the ice accretion rate or extent of the ice formation exceeds the performance capabilities of the airplane. In such cases, the performance and flying characteristics of the airplane may not be maintained e.g the airspeed in cruise or the vertical speed in climb cannot be controlled and keeps decreasing. The flight crew must follow the AFM specific guidance and leave those conditions immediately. As a general rule and based on experience, such environmental conditions have limited vertical extension. By descending several hundred or a few thousand feet, it is generally possible to exit such conditions. the engines will provide more power. The first effect of ice accretion on the airplane consists of an increase in drag. In turn, this will result in either a loss of climb rate in a constant airspeed climb or a loss of airspeed in level flight with a given power (or during any attempt to climb at a constant vertical speed or fixed pitch attitude). The rate of ice accretion depends on many parameters and the resultant drag increase can be very slow and progressive or, at other times, build quickly. The lower the airspeed, such as in a climb or in a hold, the faster and more detrimental the performance decrease can be, which highlights the importance of early identification of airplane performance loss. In addition to the effect of ice accumulation on the airframe, ice on the propeller blades will interfere with the aerodynamics of the blades reducing their efficiency and thereby reducing available thrust leading to a further reduction in climb rate or airspeed. A degree of propeller performance can be regained by increasing the propeller speed setting. First, this causes the propeller blades to operate at a lower angle of attack relative to the on-coming airflow which can increase thrust. Second, higher propeller speed may improve shedding of the ice from the propeller due to higher centrifugal forces on the blades. Even with ice protection systems operating properly, inter-cycle and residual ice accretion on the airplane may also significantly reduce the maximum lift available. The airplane may stall at higher speeds and lower angles of attack than normal. Manufacturers provide modified minimum airspeeds in icing conditions to ensure that the same flying qualities and margin above stall as with a clean airplane are maintained when flying the airplane with the ice protection systems operating in the certified icing envelope. When icing conditions are forecasted, the effect on airplane performance must be anticipated both in flight planning and during the flight. Flight crews must anticipate the impact on airplane performance and target flight levels for the cruise which will ensure adequate margins above minimum icing speeds. It is important to always operate the ice protection systems according to the procedures in the AFM. After encountering icing, failure to operate the boots in accordance with the AFM may lead to ice accumulations in excess of the design criteria and negate airplane handling and performance margins even when operating at the higher prescribed airspeeds. With ice accumulated on airplane lifting surfaces, an airplane may exhibit stall onset characteristics before stall warning activation. Low speed cues such as buffet or instability in roll could likely precede an impending stall and must be interpreted as approaching the stalling angle of attack even if it occurs before stall warning devices have activated. To provide increased protection from impending stall in icing conditions, certification regulations have been amended to require recent turboprop designs to modify the stall warning when the airplane is being operated in icing conditions. Modified stall warning settings are implemented on airplane by defining a "representative" stalling angle of attack for airplane operations in the certified icing envelope with ice protection systems operating normally. The airplane is assumed to have "inter-cycle" ice as well as "residual" ice on the airframe. The activation angle for stall warning is then decreased by a proportionate amount to provide the necessary margin above the predicted stall through the activation of an "icing mode". The effect of selecting this function is to cause stall warning to activate at a higher airspeed (lower angle of attack) to provide the necessary margin above stall for low speed flight operations. As a result, AFM minimum airspeeds increase accordingly whenever the "icing mode" function is active. A consequence of this function, however, is that the airplane must be flown at higher minimum airspeeds regardless of whether the airplane has contamination on the leading edges or not in order to avoid inadvertent activation of stall warning. As long as there is any visible ice on the airframe or any surfaces, the airplane must be still considered to be contaminated with ice and the appropriate minimum icing speeds and performance penalties remain applicable to the airplane. Note that ice accumulations on un-protected surfaces will continue to affect the airplane even after the protected surfaces are clear of ice. These ice formations will only be cleared from the airplane if the airplane flies into warm air conditions significantly above freezing to allow the ice to melt or the ice sublimates from the airframe over the course of a long flight in dry air conditions. The airplane can only be considered aerodynamically clean when all ice is removed from visible areas of the airplane. Only then can the appropriate minimum airspeed be reverted to "clean" airplane values. It is often necessary to land the airplane with visible contamination still on the airframe despite arriving at destination in clear dry air conditions after the icing encounter. In these situations, the appropriate approach and reference speeds for operations in icing conditions must continue to be adhered to throughout the approach, landing or potential go-around. In the case of an encounter with super-cooled large droplet icing (e.g. rain and droplets that splash with SAT below +5°C), airplane types with un-powered aileron controls may be susceptible to un-commanded and possibly uncontrollable rolling motions where water droplets have flowed back behind the protected surfaces before freezing and formed ridges that cannot be removed by de-icing equipment. As ice accumulates behind the protected area in front of the ailerons, the distribution of pressure on the upper surface of the wing and aileron is affected. This may result in an increase or decrease in control forces as the control wheel is deflected or unusual buffeting felt in the control wheel. Should airflow completely separate in front of the aileron, the control wheel can be suddenly deflected to full travel with no pilot input and control forces may be physically beyond the pilot's ability to overcome. If any of these effects are encountered, immediately reduce the airplane angle of attack to restore control, and then follow the AFM recommended procedures. Ice accumulated behind the protected surface of the aerofoil will continue to affect the handling characteristics of the airplane even after the area ahead of the accumulation is clear of ice. The only way to remove this type of ice formation is to find warm air conditions significantly above freezing to allow the ice to melt. The purpose of an automated flight system (AFS) is to assist the pilot and not replace them. An AFS will do what it has been programmed to do within the capabilities of its certified envelope. By design, an AFS has sufficient authority to adjust for unusual conditions until the commands reach full authority of the system, or cannot be sustained. Approaching the limits of an AFS can mask the actual airplane trim state as well as resultant changes in performance and handling qualities. If such conditions go unnoticed, the airplane state may deteriorate leading to an undesired airplane state unless the pilot properly recognizes the compromised condition and initiates recovery. If the auto trim system has been adjusting longitudinal trim as the airplane slows down, a large push force may be required to lower the airplane nose and regain airspeed when the autopilot is disengaged (or automatically disengages). An autopilot can also disconnect unexpectedly because of excessive roll or pitch rates, roll or pitch angles, control surface deflection rates, or forces that are not normal. These autopilots could be working exactly as designed within the limits of their envelope. During cruise at high altitude, the autopilot will be engaged with the pitch in an altitude hold mode and the auto throttles in a speed mode (if equipped). Changing atmospheric conditions can exceed the limits of thrust or power available and if that is the case, the crew will be required to descend to a lower cruise altitude. The primary target parameter of the vertical speed (V/S) mode of the AFS is the selected vertical climb or descent rate with airspeed normally controlled by thrust through thrust adjustment. However the speed will not be maintained if the descent or climb rate is excessive. 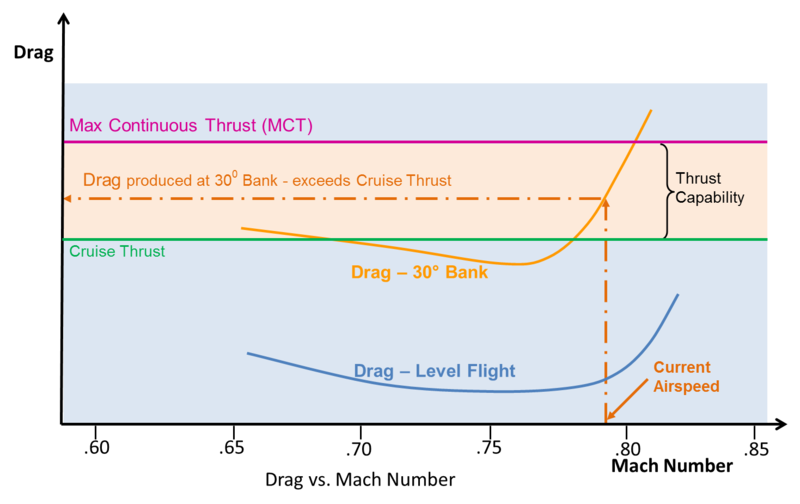 When an excessive vertical descent rate is selected, idle thrust may not be low enough to hold the selected airspeed and the airplane will speed up. The AFS would be doing exactly what it was commanded to do even though the command was inappropriate. 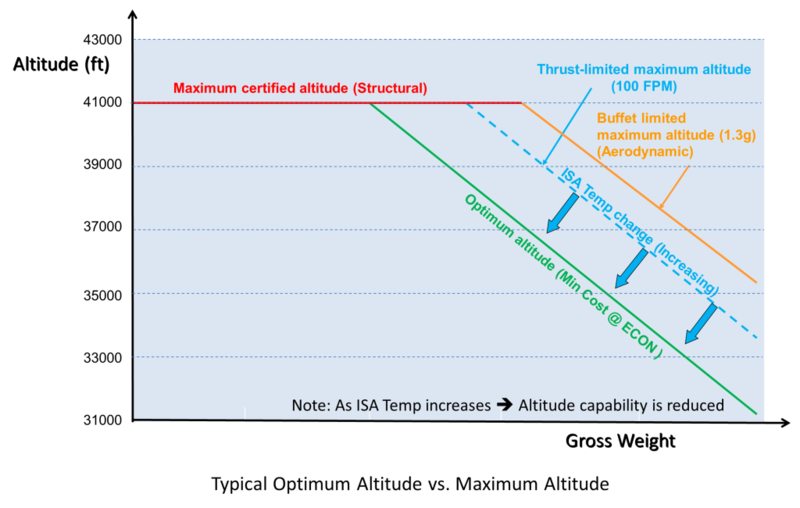 Conversely, if an excessive climb rate is selected, the thrust available can be less than the thrust required for that selected vertical speed rate. Because the AFS primary parameter in V/S is the target vertical speed the selected airspeed must be sacrificed when maximum available thrust is less than what would be needed to respect the commanded V/S, the result will be airspeed decay. At lower altitudes, thrust/power available might be sufficient to allow both the selected V/S climb rate and command airspeed to be maintained, but as altitude increases, the thrust available decreases which can eventually result in airspeed decay while the AFS maintains the target vertical climb rate. As a general guideline, V/S should not be used for climbing at high altitudes in sweptwing jet airplane or at any altitude in straight wing turboprop airplane. If V/S is the chosen climb mode by the pilot, constant monitoring and adjusting will be necessary. Improper use of V/S can result in airspeed loss and eventually a stall, although many airplane have envelope protection modes where AFS reverts to a mode that is designed to prevent stall. Manual throttle systems, or inadvertent auto throttle disengagement at or near idle during a descent will also result in speed decay at level off if the thrust or power is not advanced to arrest the decay in airspeed as the autopilot commands the airplane nose up to maintain the programmed vertical flight path. The airplane can quickly enter a low energy situation causing an undesirable airplane state which can result in a stall. Pilots must understand the performance of their airplanes when selecting vertical modes. V/S can be used for descent; however, selecting excessive vertical speeds can result in airspeed increases into an overspeed condition. An upset can result in an engine flameout, and conversely an inappropriate response to an engine flameout can lead to an upset. Undesired airplane states that result in very low airspeed, stall conditions, large sideslip angles or other occurrences that reduce or distort the flow of air into the engine intakes, may lead to thrust or power fluctuations or even to engine flameout(s). At higher thrust/power settings an engine flameout should be quite obvious to detect however at thrust/power settings near idle it will be less obvious. The first indication to a flight crew of an engine anomaly may be a lack of thrust response, or yawing and/or rolling moments due to asymmetric thrust, when the thrust or power levers are advanced. Previous sections have reviewed causes of airplane upsets to emphasize awareness and avoidance of airplane upsets. Basic aerodynamic information indicates how and why transport airplanes fly. The information provides the foundation of knowledge necessary for intervention in order to recover an airplane that is diverging from desired flight conditions. This section highlights several issues associated with airplane upset recovery and presents basic recommended airplane recovery techniques and training scenarios for pilots. There is an infinite number of situations that pilots can experience while flying an airplane. The techniques that are presented in this section are applicable for most situations. It must be emphasized that the degree of upset will define how prompt or aggressive the required control inputs will be to recover from the event. In all cases the pilot response to an upset must be appropriate to arrest and recover the condition. Up to full-scale control deflections may be necessary. However, initiating recovery with arbitrary full-scale control deflections could actually aggravate the situation. An excessive or inappropriate control input that overshoots the desired response can startle the pilot and cause one upset to lead to another. Pilots must be or become situationally aware before they are able to take appropriate actions. These three activities must be part of every recovery from an upset. 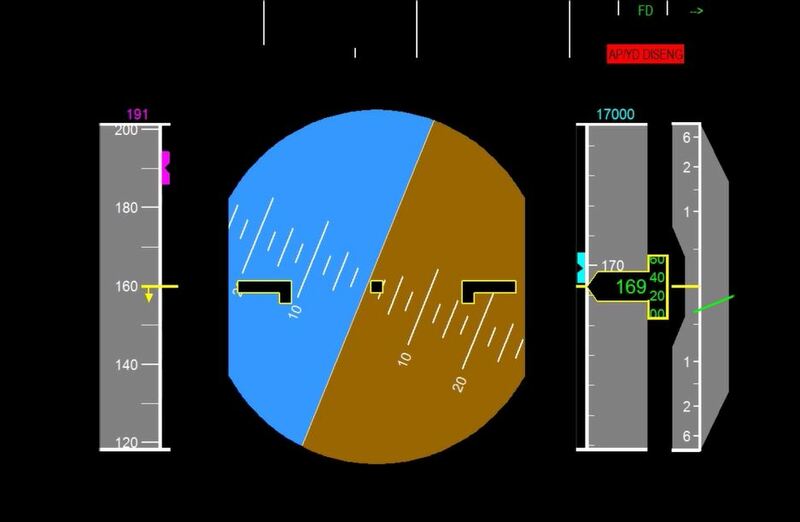 A pilot actively monitoring is an engaged pilot who has a wealth of information available to them in modern cockpits. Consequently, they are more situationally aware than all previous generations of pilots. An engaged pilot will be ready to intercept an unintentional airplane divergence which is the overwhelming goal: avoid an upset from developing in the first place. The first actions for recovering from an airplane upset must be correct and timely. It is very important for the crew to realize the differences in airplane handling at high altitude, versus low altitude (less thrust/power available and more sensitive flight controls). Managing startle is imperative all the time, but particularly in high altitude conditions where the pilot has the least amount of hands on experience to manipulate the airplane. The key point is to use gentle control inputs and not arbitrary open loop inputs. Exaggerated control inputs through reflex responses must be avoided. Troubleshooting the cause of the upset is secondary to initiating the recovery. However, the pilot still must recognize and confirm the situation before a recovery can be initiated. Regaining and then maintaining control of the airplane is paramount. Communication between crew members will assist in the recovery actions. At the first indication of a flight path divergence, both pilots should announce what is being observed. It is necessary to use the primary flight instruments and the airplane performance instruments when analyzing the upset situation. 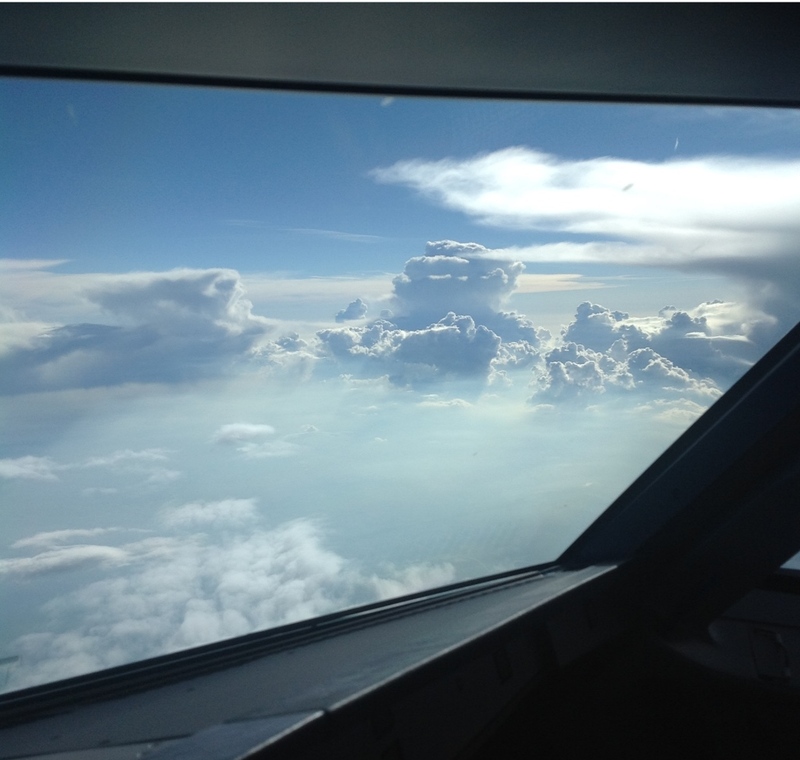 Visual meteorological conditions may allow the use of references outside the airplane; however, it can be difficult to see the horizon if the field of view is restricted due to window geometry and overhead panel placement during both high and low pitch attitudes. Pilots must be prepared to analyze the situation during darkness and when instrument meteorological conditions (IMC) exist. The PFD or Attitude Indicator is a primary reference for recovery. For a nose low upset, normally the airspeed is increasing, altitude is decreasing and the vertical speed indicator (VSI) indicates a descent. For a nose high upset, the airspeed normally is decreasing, altitude is increasing and the VSI indicates a climb. Other attitude sources must be cross checked for accuracy of interpretation of the situation. These sources include, but are not limited to the Standby Attitude Indicator and the pilot monitoring (PM) instruments. Pitch attitude is determined from the PFD or Attitude Indicator pitch reference scales. Most modern displays also use colors (blue for sky, brown for ground) or ground perspective lines to assist in determining whether the airplane pitch is above or below the horizon. Even in extreme attitudes, some portion of the sky or ground indications is usually present to assist the pilot in analyzing the situation. The bank indicator on the PFD/Attitude Indicator should be used to determine the airplane bank. Communicate with other crew member(s). Recovery techniques presented later in this section include the phrase, "Recognize and confirm the situation". This situation analysis process is used to accomplish that technique. There are issues associated with differences between simulator training and on-airplane recoveries. A simulator can provide the basic fundamentals for upset recovery, but some realities such as positive, negative and lateral g's, startle factor and environmental conditions are difficult or impossible to replicate. The physical and psychological effects and the airplane response during recovery can be significantly different from that experienced during simulator training. Simulator limitations at the edges of the flight envelope can also cause fidelity issues because the simulator recovery may not have the same response characteristics as the airplane. However, provided the simulator valid training envelope limits are not exceeded, the control loading responses and instrument indications of the simulator should accurately replicate airplane responses. The reaction of the simulator is based on given parameters (CG, weight, speeds, etc.). An actual encounter at greatly different parameters than those practiced in the simulator may result in a different airplane response. For example, flight controls are more effective at 250 kt than at 150 kt. It has already been stated that airplane upsets do not occur very often and that there are multiple causes for these unpredictable events. An engaged pilot will be ready to intercept an unintentional airplane divergence which is the overwhelming goal to avoid an undesired airplane state from developing in the first place. An engaged pilot has a wealth of information available to them in modern cockpits that allows them to be more situationally aware than all previous generations of pilots. Unexpected low airspeed, stall warnings, buffeting and large changes in airplane attitude (design dependent) when the airplane is on autopilot can startle an un-engaged flight crew. Pilots are usually surprised or startled when a dynamic upset does occur, even if they are engaged through actively monitoring, but they will be better situationally aware to adapt to the situation. An un-engaged pilot will need to regain situational awareness in order to identify the situation. Only an engaged (and therefore situationally aware) pilot/crew can effectively recover from an upset. The pilot must overcome the surprise and quickly shift into analysis of what the airplane is doing and then implement the proper recovery. Pilots must avoid reacting before analyzing what is happening and avoid fixating on one indication instead of diagnosing the situation. Effective training and crew engagement (active monitoring) during all cockpit activity is the best insurance to deal with startle factor. Troubleshooting the cause of the upset is secondary to initiating the recovery and regaining control of the airplane. Pilots are normally uncomfortable with unloading g forces to less than 1 g on passenger airplanes. They must overcome this reluctance if faced with a situation that requires unloading the airplane to less than 1 g by pushing forward on the pitch controls. While flight simulators can replicate normal flight profiles, they cannot replicate sustained g forces, other than 1 g.
Pilots must anticipate a significantly different feeling in flight during less than 1 g situations. Unsecured items may be floating about the cockpit in extreme cases. Utilizing up to full flight control inputs is not a part of routine airline flying. Pilots must be prepared to use full flight control authority if the situation warrants it. Flight control inputs are more effective at increased speed/reduced angle of attack. Conversely, at low airspeeds or approaching the critical angle of attack, larger control inputs are needed for the same airplane response. Attitude and flight path changes can be very rapid during an upset, which could require large or even full scale control inputs. It is critical to guard against control reversals. There is NO situation that will require rapid full-scale control deflections from one side to the other. It may be counter-intuitive to use forward pitch control deflections near the ground when recovering from a high angle of attack. However, if the airplane is stalled while already in a nose down attitude, the pilot must still push the nose down in order to reduce the angle of attack. Altitude cannot be maintained and should be of secondary importance. A large risk exists for pilots to revert to previous experiences and/or training appropriate to Non-similar airplanes, especially if confronted with an unexpected upset event. Aerodynamic principles do not change, but airplane design may create different flight characteristics. Training and experience gained in one model or type of airplane may or may not be transferable. 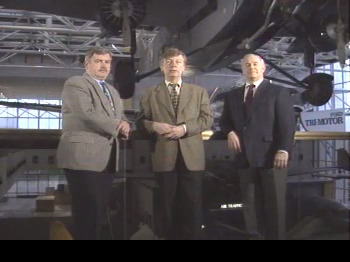 Inertia effects, roll and pitch rate responses, stability and maneuverability, the requirement to use rudder, straight wing versus swept wing, cockpit visibility and flight control systems are several critically important distinctions between airplane types. Airplanes with electronic flight control systems provide additional protection against entering into many upset situations. These systems also assist the airplane to return to normal flight, if necessary. However, when fly-by-wire airplanes operate in a degraded mode, flight control inputs and the responses can be similar to non fly-by-wire airplanes. There could be confusion on the flight deck as to what exactly happened to cause the original upset. Care should be taken not to take action that could cause a repeat of the previous upset or let the airplane progress into a different kind of upset. Pilots may not be able to recall the forces experienced or the extent of the maneuvers performed to any great detail. If large g-forces (vertical and/or large side-slip angles) are experienced, an airplane inspection would be required. Training related to upset and/or stalls should emphasize awareness and avoidance. Situationally aware flight crews are those who actively monitor their flight. As such, they are able to assess the energy, arrest any flight path divergence and recover to a stabilized flight path before an extreme upset ever occurs. This provides the basis for relating the aerodynamic information and techniques to specific situations. Consolidation of recovery techniques into these two situations is done for simplification and ease of retention. Airplanes with electronic flight control systems (fly-by-wire, FBW), have features that should minimize the possibility of an upset and assist the pilot in recovery, if it becomes necessary. When FBW airplanes are in a degraded flight control mode, the recovery techniques and aerodynamic principles discussed in this training aid are appropriate. Principles of recognition and recovery techniques still apply independent of flight control architecture. Autopilots (A/P) and autothrottles (A/THR) are generally intended to be used when the airplane is within its normal flight envelope. If the A/P and/or A/THR are responding correctly to a flight path and/or energy divergence, it may not be appropriate to decrease the level of automation. Adhere to OEM guidance. 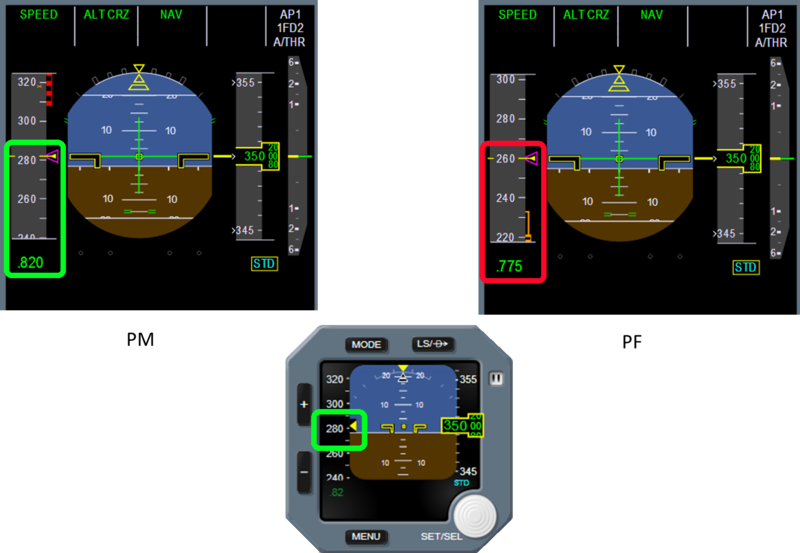 The following animation illustrates an overlay of what the airplane reaction would have been with autoflight system remaining engaged (red track) compared to disengaged with pilot inputs (blue track). If the A/P and A/THR are not responding correctly they must be disconnected. Analysis of the energy state of the airplane is required. This analysis assesses the energy and trend. This includes but is not limited to altitude, airspeed, attitude, load factor, power setting, position of flight controls, position of drag and high-lift devices and the rate of change of those conditions. This analysis should allow the crew to make appropriate changes, such as use of speed brakes or lowering the landing gear for drag as necessary to aid in the recovery. In other words, manage the energy. The recovery techniques assume the airplane is not stalled. If the airplane is stalled, it is necessary to first recover from the stalled condition before initiating upset recovery techniques. Follow your OEM procedure for stall recovery. Regardless of attitude, a wing can be stalled at any airspeed and altitude, if the critical angle of attack is exceeded. It is important to understand that at high speeds, although it is possible to stall the wing, the structural design limits could be exceeded well before the stall actually occurs. Previously, pilots were improperly trained and evaluated to recover from an approach to stall with emphasis on minimum loss of altitude while "powering" out of the near-stalled condition. The only way to recover from a stall is to reduce the Angle of Attack. Regardless of how close the airplane is to the ground, it is impossible to recover from a stalled condition without reducing the angle of attack and that will certainly result in a loss of altitude. Although the thrust or power may supplement the recovery, it is not the primary control. At stall angles of attack, the drag is very high and excess thrust available to overcome this drag may be marginal. If the engines are at idle, the engine acceleration could be very slow, thus extending the recovery. At high altitudes, available thrust is reduced. The elevator is the primary control to recover from a stalled condition because, without reducing the angle of attack, the airplane will remain in a stalled condition until ground impact, regardless of the altitude at which it started. Stall recovery requires a deliberate and smooth reduction in angle of attack. Thrust/power can supplement the recovery only after the angle of attack has been reduced below the critical angle of attack. Although stall angle of attack is normally constant for a given configuration, at high altitudes swept wing airplanes will stall at a reduced angle of attack due to Mach effects. The pitch attitude for recovery will also be significantly lower than what is experienced at lower altitudes. Buffet will likely precede an impending stall on swept wing airplanes and may even occur before the activation of stall warning devices. Recovery from the stall is the primary objective, and altitude loss must be accepted. Flight crews must exchange altitude for energy. Unlike low altitude recovery from stall, at high altitude, considerable altitude will be lost. If altitude recovery is attempted prematurely, a secondary stall will likely occur. If landing gear and/or slats and flaps are already extended, it is important to not change the airplane configuration until the airplane vertical flight path has been brought back under control. While it is routine to reduce the flap setting on a standard go around as a means of reducing airplane drag, in a high angle of attack situation, the increase in angle of attack that occurs as the flap transitions may place the airplane deeper into the stalled condition resulting a delayed recovery and increased loss of altitude. In a similar fashion, selection of landing gear up results in a substantial increase in airplane drag for the period the landing gear doors are open on many airplane types. In a critical recovery situation, the increase in drag would result in a further unanticipated loss of airspeed. Follow your OEM specific procedures for a stall event with respect to changing airplane configuration during the recovery back to normal flight conditions. The following techniques represent a logical progression for recovering the airplane. They are not necessarily procedural. The sequence of actions is for guidance only and represents a series of options for the pilot to consider and to use depending on the situation. Not all actions may, or should, be necessary once recovery is underway. If needed, use pitch trim sparingly. Careful use of rudder to aid roll control should be attempted only if roll control is ineffective and the airplane is not stalled. inability to arrest the descent rate. It is not appropriate to wait until several stall cues are experienced prior to initiating the recovery. Note: Follow the guidance published by your aircraft OEM. Recognize and confirm the developing situation. Monitor Airspeed and Attitude throughout the recovery and announce any continued divergence. Apply as much nose-down control input as required to obtain a nose-down pitch rate. Adjust bank angle not to exceed 60 degrees. 1 If the A/P and/or A/THR are responding correctly to arrest the divergence, it may be appropriate to keep the current level of automation. 2 A large out-of-trim condition could be encountered when the A/P is disconnected. 3 This may require use of pitch trim to manage control forces during large airspeed changes. Avoid entering a stall due to premature recovery at low speed or excessive g-loading at high speed. Warning: excessive use of pitch trim or rudder may aggravate the upset situation or may result in high structural loads. Either Pilot: Recognize and confirm the developing situation. Announce: "Nose High"
Explanation: A critical element in recognition and confirmation is to clearly understand the airplane energy state and the rate at which it is changing because this will have an effect on how the recovery is handled. This is done by referring to pitch attitude and/or flight path vector, airspeed and airspeed trend, altitude and vertical speed from the PFD (or ADI). This is because the FD system could be providing incorrect guidance. Explanation: The A/P and/or A/THR must be disconnected if they are not arresting the divergence. However, if the A/P and/or A/THR are responding correctly to arrest the divergence, it may be appropriate to keep the current level of automation. A large out of trim condition could be encountered when the A/P is disconnected. PITCH: Apply as much nose-down pitch control and incremental trim input(s) as required to obtain a nose-down pitch rate. Explanation: This may require as much as full nose-down pitch control input. Incremental nose down trim inputs may improve elevator control effectiveness and reduce high pitch control forces. Excessive use of pitch down trim can make the recovery phase of the upset more difficult. Explanation: Select up to maximum thrust/power available while ensuring adequate pitch control. For airplanes with underwing mounted engines, increasing thrust may reduce the effectiveness of nose down pitch control. It may be necessary to limit or reduce thrust to the point where control of the pitch is achieved. Explanation: If the previous pitch and thrust inputs have been unsuccessful, banking the airplane to allow the nose to drop toward the horizon will be necessary. The bank angle applied should be the least possible to start the nose down and never exceed approximately 60 degrees. If the bank angle is already greater than 60 degrees, it should be reduced to an amount less than 60 degrees. The least difficult piloting task is with wings level or near level. Use of bank increases the piloting workload in an already high workload condition of flight. Although the rolling maneuver changes the pitch rate into a turning maneuver, sideslip build up is a large risk at low airspeeds and high AOA. If full pitch and roll control are ineffective, rudder input may be required to induce a bank angle for recovery. Only a small amount of rudder input is needed. Too much rudder applied too quickly or held too long may result in loss of lateral and directional control and cause structural damage. Explanation: Recover to level flight while avoiding a stall due to premature recovery at low speed or excessive g-loading at high speed. This may require use of pitch trim to manage control forces during large airspeed changes. Confirm desired airspeed and adjust thrust to establish the required flight path. Adjust bank angle in the shortest direction to wings level. 3 It is important to reduce g-loading while attempting to roll to wings level because it increases the roll effectiveness while decreasing the asymmetric loads on the airplane. 4 This may require use of pitch trim to manage control forces during large airspeed changes. Either Pilot: Recognize and confirm the situation. Announce: "Nose Low"
Explanation: Even in a nose low situation, the airplane may be stalled and it would be necessary to recover from a stall first. Roll, in the shortest direction to wings level. Explanation: In general, a nose low, high-angle-of-bank requires prompt action, because decreasing altitude is rapidly being exchanged for increasing airspeed. The consequence of the increasing airspeed is rapid g-load build up from the original 1-g trimmed condition. It is important to reduce g-loading while attempting to roll to wings level because it increases the roll effectiveness while decreasing the asymmetric loads on the airplane. Decreasing the g-load will be achieved by applying forward pitch control toward 1-g. This is counter-intuitive while in a dive condition, even though it is of critical importance. If roll control is ineffective after unloading, rudder input may be required to reduce bank angle for recovery. Explanation: Use Thrust or Speed brakes to control the airspeed. Confirm desired airspeed and adjust thrust and/or speed brakes to establish the required flight path. Training assumption: All scenarios will be demonstrated to effectively teach the trainee when (or if it is necessary) to disconnect the autoflight system. For example, if transitioning a wake encounter, it may be best to leave the autoflight system engaged rather than disconnecting it as long as the autoflight system is performing adequately. Demonstrate pitch rate performance of the airplane at different speeds and different configurations and with flaps retracted/extended. Also, show pitch rate performance at an aft CG versus a forward CG if flight qualities are significantly different. Demonstrate pitch response for a given controller deflection at VREF versus clean configuration speed, and at 250 kt IAS, VMO and MMO. Demonstrate the pitch responses of the airplane at different speeds and altitudes. Demonstrate pitch coupling of the airplane when a large thrust change occurs, at low and high speeds, and low and high altitude. Demonstrate pitch response (coupling) for a large thrust increase (idle to go-around thrust), starting in trim at low altitude (2 000 feet) and low speed (in landing configuration at 1.1 VS) versus at VREF, in clean configuration at 250 kt IAS, VMO or MMO. Repeat in clean configuration at 1.1 VS and MMO at high altitude (cruising altitude). Note: For airplanes that automatically trim or control the attitude when adjusting thrust (e.g. most fly-by-wire airplanes), the automatic pitch compensation system should be disabled for this exercise (e.g. direct law). Experience the pitch coupling of the airplane with thrust changes of underwing mounted engines, at different speeds and altitudes, including situations with marginal pitch control capability. Demonstrate what the full roll capabilities of the airplane are. This is not to develop skills in maneuvering with rudder. Rather it is intended to highlight airplane reaction to rudder input, and the risk of over control or untimely rudder input (deflection when not needed). If airplane roll is required, and if normal roll control is totally lost, there would be a requirement to use rudder in a manner it is not normally intended to be used. Use rudder to achieve desired bank angles to maneuver at various altitudes. Pilots need to clearly understand the risks of inputting rudder when it is not needed. This demonstration is to illustrate that with extremely careful rudder inputs, very small bank angles can be achieved. However, the objective of the demonstration is to highlight that too much rudder applied too quickly or held too long may result in loss of lateral and directional control and cause structural damage. Demonstrate acceleration between two speeds of which the airplane is capable at low, medium and high altitude. For example, 200 to 250 knots at low, medium and high altitude (where those speeds correspond to Mach numbers at high altitude). Observe time to reach target speed in level flight and in descending flight. Demonstrate and highlight the reduced thrust/power available at higher altitudes. Demonstrate acceleration performance from the second regime (back side of the power curve) at low altitude and high altitude. 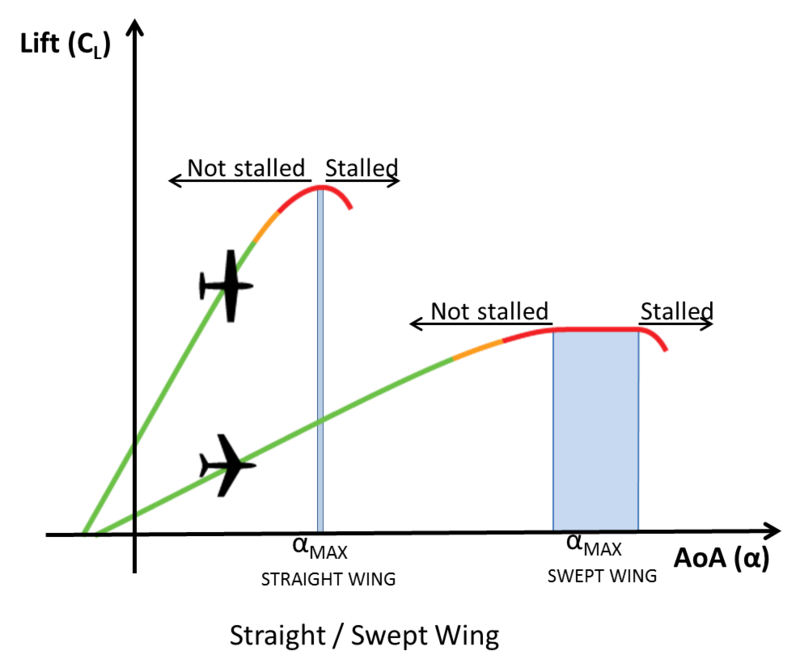 Observe capability with the thrust available (if available thrust will not permit acceleration, the only option will be to accelerate by descending). Demonstrate the potentially different recovery technique from flight in the second regime at low altitude versus high altitude. Demonstrate the relationship between maximum cruise/climb/continuous thrust and take-off/go-around (TOGA) thrust at high altitude. Highlight to the pilot, the practical relationship between available engine power modes at high altitude. Teach the pilot that TOGA is not likely to produce more thrust at maximum altitude than cruise thrust, for example. Demonstrate acceleration capabilities through descent versus power application. The objective is to understand the advantage of using elevator instead of thrust levers to regain the desired energy state (observe a rapid acceleration during descent versus the slow acceleration previously demonstrated with only use of power). Demonstrate the inability of the airplane to power out of a high-altitude slow-down. Demonstrate high-speed buffet (if applicable) and low-speed buffet. Demonstrate the airplane behavior at the low and high-speed buffet entry. Highlight how loading the airplane in a high-speed buffet will aggravate the condition. With A/P off at high altitude, demonstrate buffet onset with increased bank angle during level flight. Teach the pilot to correctly identify the low- and high-speed buffet with corresponding recovery techniques. This training needs not be completed in simulators, however, if the choice is to use simulators, extreme care must be taken to ensure negative transfer of training does not result. Current simulators are not capable of generating sustained G loading, therefore any dynamic maneuvering will not be correctly simulated. During upset recognition and recovery practice, the trainee will experience nose-high and nose-low, high and low speed, high and low bank angle airplane upsets. Each of these maneuvers requires the pilot to return the airplane to a normal flight condition. Display the PFD parameters (attitude, airspeed and altitude) when upset so that the trainee interprets the situation and demonstrates appropriate recovery control inputs (pitch, roll, thrust and speedbrake controls). The expectation is that the trainee analyze the situation and demonstrate initial control inputs direction appropriate to the situation to recover from an upset and learns to manage the energy, arrest the flight path divergence and recover to a stabilized flight path. When faced with an upset and a rapidly evolving energy state, the trainee should be able to recognize the attitude and timely apply initial control inputs in the correct direction for the recovery procedure. Loss of pilot situation awareness leading to a spiral dive. A spiral dive can be defined as "a steep descending turn with the airplane in an excessively nose-down attitude and with the airspeed and g-load increasing rapidly". Highlight how a loss of situation awareness can allow a flight path degradation leading to a spiral dive. Demonstrate the characteristics of airplane longitudinal and lateral-directional stability. Show that controlling the spiral is easily achieved by unloading the rapidly increasing g-loads while rolling the wings level, reducing power and NOT pulling back on the stick or yoke until approaching wings level. Point out how spirals tighten if an attempt is made to raise the nose before approaching wings level and note the rapid loss of height and rapid increase in airspeed. A spiral dive requires prompt action, because altitude is rapidly being exchanged for airspeed. Rapidly increasing g-loading will reduce roll effectiveness and it will be necessary to reduce the g-load to regain roll effectiveness. This is counter-intuitive while in a dive condition, even though it is of critical importance. It is also important that g forces are properly controlled during the recovery to avoid accelerated stall or overstress to the airplane. Getting trapped in a spiral dive can happen very easily if you get caught inadvertently flying into poor weather condition (unexpected transition from VMC to IMC) or flying at nighttime where no horizon exists to provide visual correction for misleading inner-ear cues. Airplane speed limitations can be rapidly exceeded in a spiral dive. Care must be taken to ensure that pilots fully understand the associated dangers and how to carry out effective recovery action. These stall training scenarios are based upon the FAA AC for Stall and Stick-Pusher Training, and the Stick-Pusher and Adverse Weather Event Training Aviation Rulemaking Committee recommendations. Clean configuration stall events (high altitude). In level flight with the autopilot on, introduce an event or reduce thrust to less than adequate for maneuvering flight. Simulator capabilities to induce stall events may include use of: airspeed slewing; attitude changes; airplane weight and CG changes; environmental changes; systems malfunctions (e.g. full or partial pitot/static blockage, artificial thrust reduction, disabling of automation). Pilots must be able to recognize the stall warning and immediately perform the stall recovery procedure. Demonstrate willingness to trade altitude for airspeed to accomplish an expeditious recovery from a stall event. Take-off or departure stall event with partial flaps. The scenario should be conducted during take-off and/or departure, at an altitude that will allow for a recovery. For an unexpected stall event on departure prior to flaps being fully retracted crew distractions may be used as per condition 1. Due to incorrect previous regulatory guidance and testing criteria, pilots would attempt recovery with no loss of altitude and without recognizing the importance of pitch control and AOA. Implement scenarios that result in stall events during an approach. Pilots must be able to recognize the stall warning and immediately perform the stall recovery procedure, demonstrate a deliberate and smooth reduction of AOA. Positive recovery from the stall event takes precedence over minimizing altitude loss. In level flight at idle thrust with the autoflight system set up to maintain altitude, introduce an event or reduce airspeed to less than adequate for maneuvering flight allowing the stick pusher to activate. Often pilots attempt recovery by suddenly applying immediate back pressure to overcome the lift-saving nose-down elevator force being applied by the stick pusher. E.g. mountain wave, rotor cloud, horizontal and vertical windshear. Demonstrate how a rapid windshear can alter the flightpath of a high-altitude airplane. High altitude upset with environmental factors as a causal factor. Entry into an unintended low energy situation as the result of failure to adequately monitor airplane performance in icing conditions. Demonstrate the correct use of airplane SOP's to monitor the airplane energy state, detect an unsustainable decrease in airplane performance and initiate the necessary change to the airplane flight profile to return to an acceptable energy state. Flight crews must consider atmospheric icing conditions to exist when visible moisture in any form is present (such as clouds, fog with visibility of one mile or less, rain, snow sleet and ice crystals) and air temperature is colder than that specified in the applicable OEM guidance (OAT, SAT or TAT). Close monitoring of the rate of climb and the airspeed should be performed to allow detection of icing conditions that may not be obvious from a visual standpoint (such as clear ice accretion, for instance). Therefore, as soon as a loss of performance is detected and even though icing may not be identified or considered as the cause for such loss of performance, descending without delay from the current altitude should always be considered as a possible course of action to regain or prevent further loss of performance. As a general rule and based on experience, such environmental conditions have limited vertical extension. By descending several hundred or a few thousand feet, it is generally possible to exit such conditions. Descending combines three positive effects: it allows the flight crew to trade altitude for airspeed increase while reducing the angle of attack, the outside temperature will generally increase and the engines would provide more power. 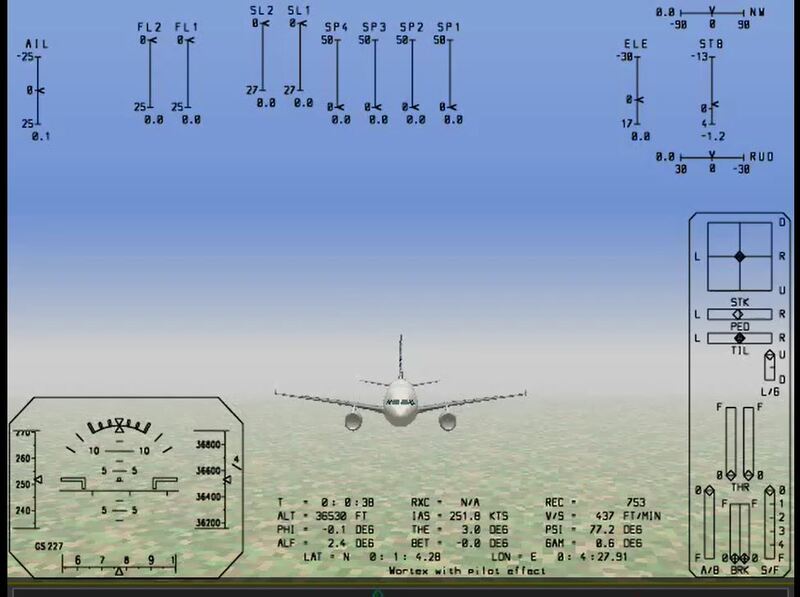 In climb, the autopilot mode must be used in IAS mode or equivalent which protects the airplane against possible loss of performance (wind gradients, icing). The target IAS is recommended to be set to provide an airspeed margin above minimum icing speed for climb. Given the factors that influence the rate of climb (weight, temperature, etc. ), it may not be easy for the crew to detect a climb performance lower than normal. However the value of the rate of climb itself provides the crew with an essential cue of what the absolute performance of the airplane is. At any time a decrease in performance is detected, the flight crew must consider if it will be necessary to stop the climb and choose a cruise level below the initial target until the airplane regains performance. At the latest, an average rate of climb that decreases below a predetermined minimum value must result in the climb being stopped (e.g. 100 ft/min or less is an indication that the airplane has reached its operational ceiling). Leveling off the airplane may not be enough to gain sufficient airspeed, which should lead the crew to descend to a lower level. In cruise, the power is generally fixed. Depending on the altitude and temperature, this power level should bring the airplane to a specific cruise IAS. This target airspeed must be known and anticipated by the flight crew so that a deviation from this value could be easily identified. As soon as a loss of airspeed is identified, the crew should assess whether the airspeed decay can be controlled or not. In case the target airspeed cannot be maintained, the crew should take all necessary actions to maintain airspeed with a sufficient margin above minimum speed for cruise flight. To regain or maintain airspeed, a first action can be to increase the power up to the maximum power available. If this is not enough and the IAS continues to decrease, the crew should prepare a descent strategy (MSA available, escape route, coordination with ATC, PAN or Mayday message if necessary to execute an immediate descent). The time available to the crew between the moment they identify the loss of airspeed and the moment they need to take an action depends on the margin that is available above the minimum speed and the rate of ice accretion. For this reason it is recommended, if icing conditions are likely on the planned route, to choose a flight level that provides a cruise speed a predetermined value above the minimum icing speed for cruise flight. To provide such a buffer adhere to OEM guidance for the specific airplane type. At the latest when the airspeed, after having decreased, approaches the minimum icing speed, the crew shall immediately apply the applicable AFM procedure and initiate a descent. Take-off and approach configuration-behind a heavy airplane. Demonstrate how a prompt roll can alter the flight path of an airplane. 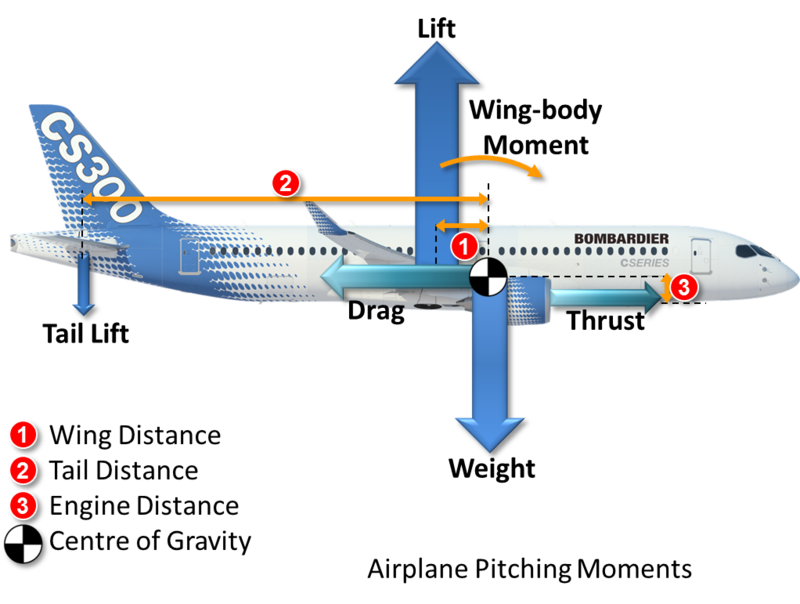 Awareness of how a vortex can affect the airplane, i.e. understanding that different roll capabilities and mass of the airplane would affect how a pilot would respond to a wake encounter. Particular emphasis must be placed on time to transition through the vortex and effective mitigation strategies. Upset as a function of roll, yaw and pitch path failures. Demonstrate how a failure or degradation of flight controls affecting each axis can create an upset. Training has to be airplane-specific to correctly reflect failure mode of that airplane (for example, hydraulics/fly-by-wire/autopilot failure). Airplane-specific training to illustrate how a flight control failure can create an upset and how to mitigate the effect (for example, a rudder hard over/runaway or limited or uncontrollable flight control surfaces). Loss of pilot situation awareness leading to loss of control (LOC). Highlight how a loss of situation awareness can allow a flight path degradation leading to LOC (for example, loss of autothrottles; misusing pitch, roll or yaw trim; thrust asymmetry, airspeed loss from changes to the temperature when operating at too high an altitude, forgetting to reengage autothrottle after making an entry in an engine monitoring log). Recent accidents have shown a failure of the crews to effectively and actively monitor their airplane energy state and/or understand system logic. Entry into an inadvertent low energy situation or stall as the result of misuse of or failure to adequately monitor autoflight systems. Demonstrate how the autoflight system could be misused to cause the airplane to unintentionally lose airspeed and/or achieve an excessive nose high attitude. Training to be airplane specific to correctly reflect the modes and indications available to the flight crew (for example, using vertical speed mode during climb/inadvertent disconnect of autothrust). Airplane-specific training to illustrate how the autoflight systems can create low energy situations leading to upset and how to avoid this by proper use of and monitoring those systems. A pilot who is aware of the energy and flight path is less likely to be startled and therefore, more likely to deal with the situation with controlled inputs versus reactive responses. Exceed the critical angle of attack and the surface will stall, and lift will decrease instead of increase. This is true regardless of airplane speed or attitude or wing shape. In a one-engine inoperative condition, airplane controllability and climb performance capability are based on the assumption the propeller of the failed engine is feathered and the airspeed is maintained at or above the minimum airspeeds defined in the AFM. This table lists the acronyms and abbreviations used in this document.